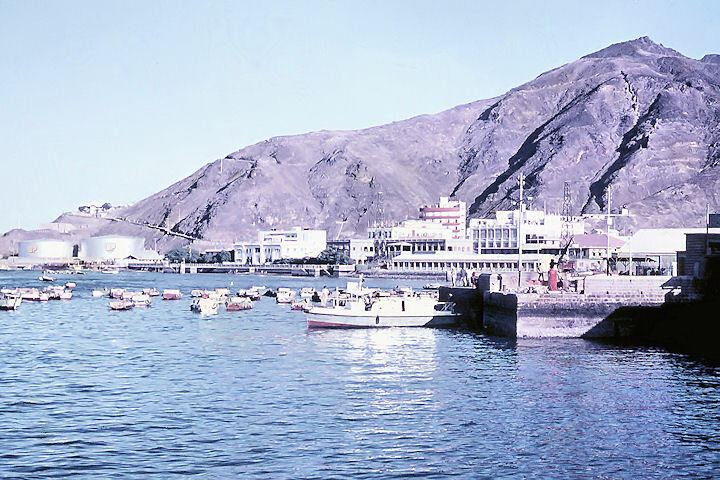 For the tourist with only a short stay, it is not difficult to get a good impression of Aden in two or three hours tour by car or taxi, since the Colony is small and much of it barren rock and sand. 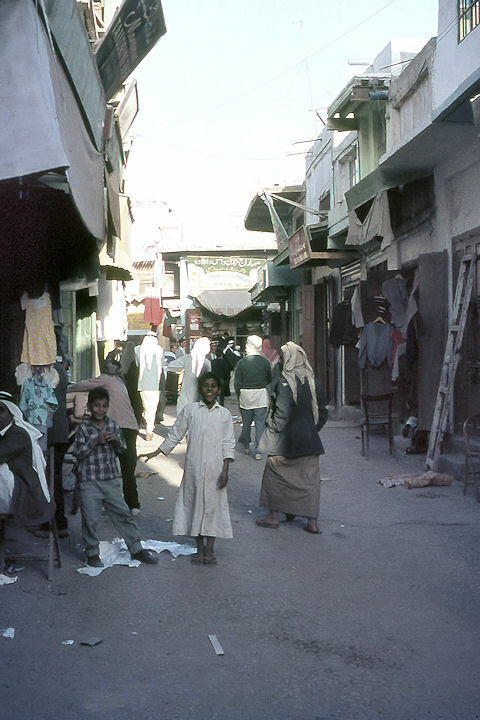 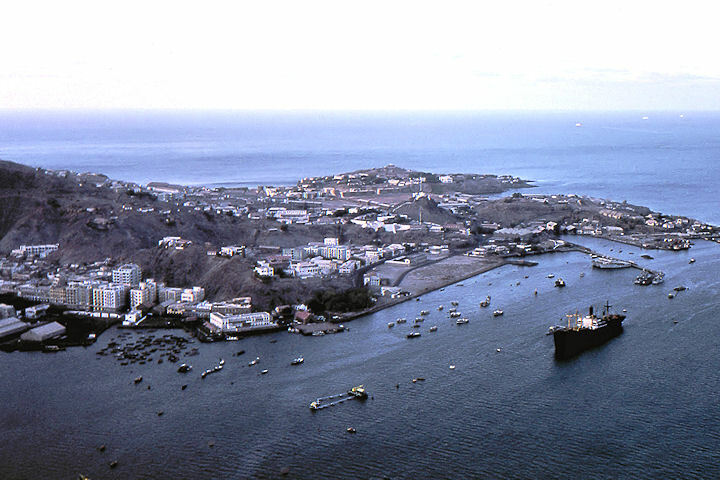 Most of the obvious “places of interest” can be visited in two or three afternoons, yet a surprising number of people spend months, even whole tours, in Aden almost without knowing of their existence. 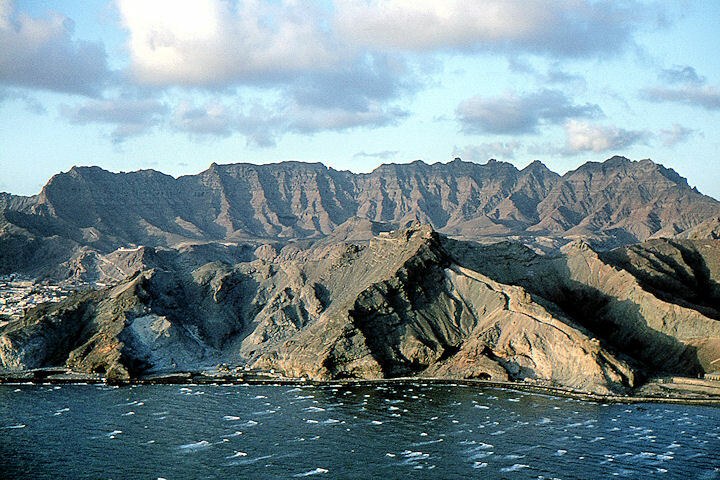 The shortest and most popular sight-seeing tour from Steamer Point is to Crater, the original commercial area and a town built in the hollow of an extinct volcano crater, on the opposite side of the peninsula. 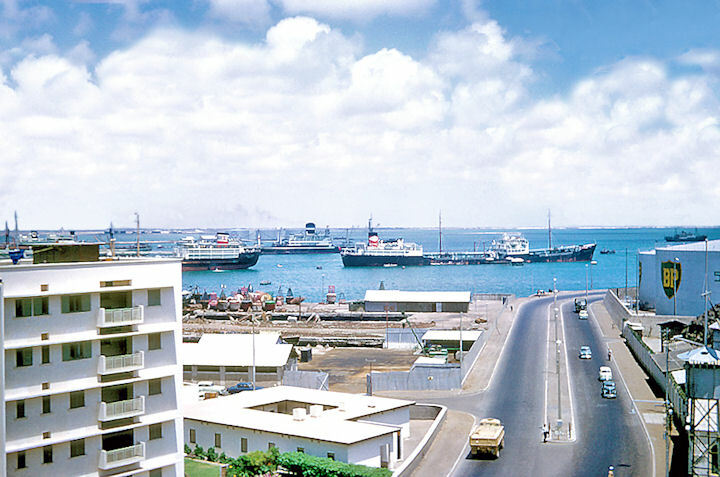 From Prince of Wales Pier the road leads past the Crescent and its shops and gardens along the front and through the Maala Straight, a new road on reclaimed land and rapidly being lined with new blocks of shops and flats, many of them service hirings. 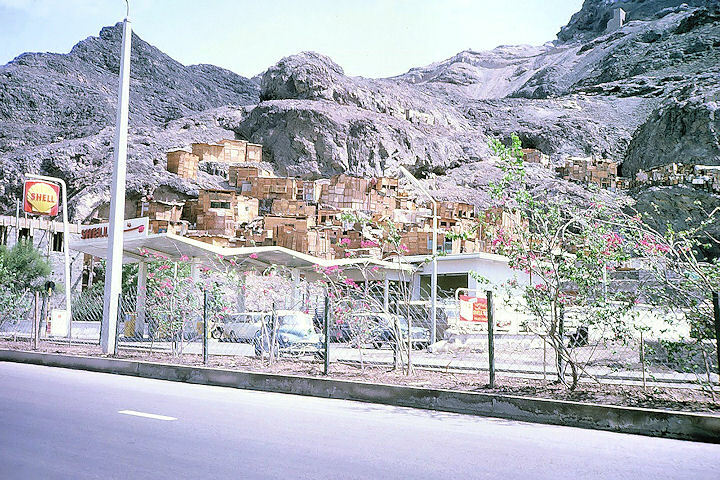 At the end of the straight, turning right at a roundabout, the road climbs past cemeteries – legend says Cain is buried here – to the Main Pass, cut through the central rocky ridge. 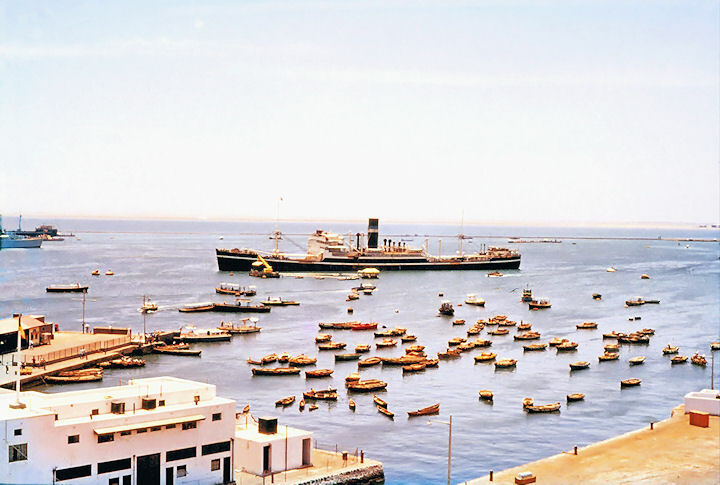 Just before driving through this, a pause on the car park beside the traffic office at its entrance gives a wonderful view back over Maala to the dhow harbour and Slave Island, where the ancient craft of dhow-building is still carried on. 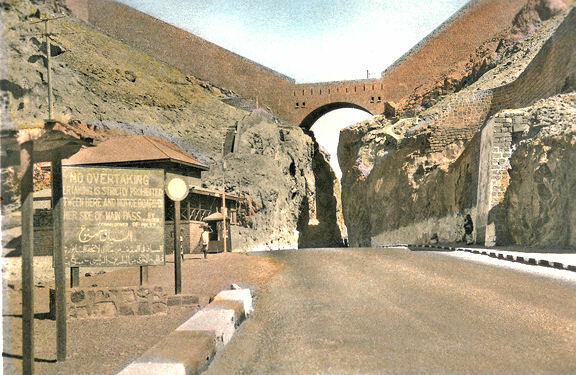 Through the deep, narrow gorge of the pass a wide, modern thoroughfare leads down into Crater. 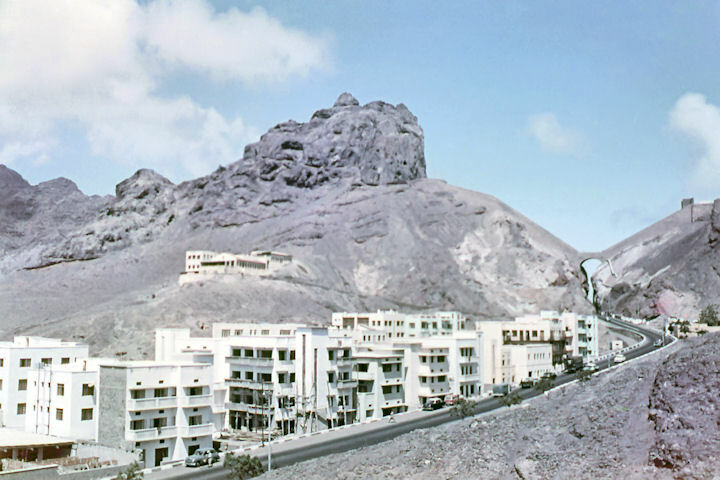 Turning left off this brings you to the residential part of the town and the sea at Front Bay – the Sultan of Lahej has a town palace on the front. 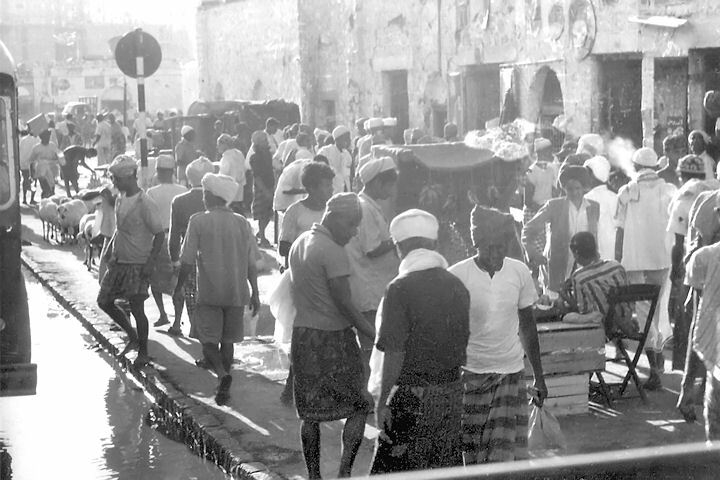 Turn right, however, and you come to the municipal market and from here you can plunge into the network of streets making up the bazaar, a rich hunting ground for the shopper – luxury goods, souvenirs, cloth and everyday oddments crowd its many small shops. 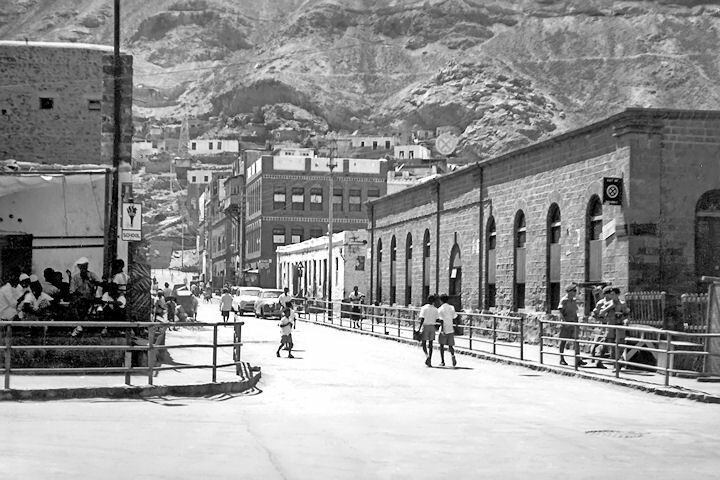 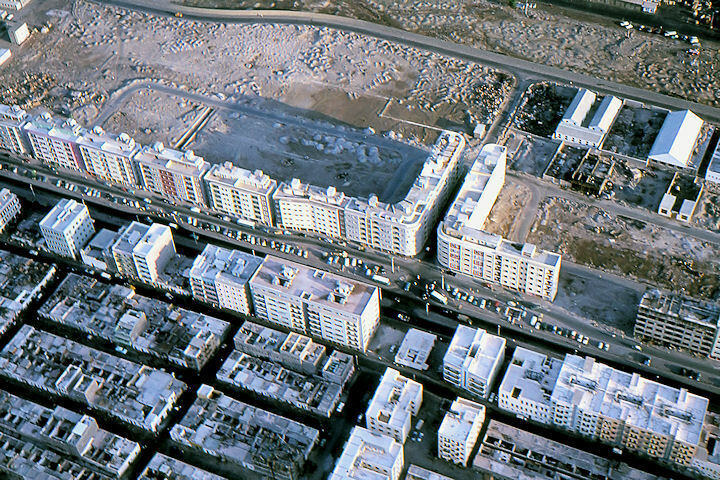 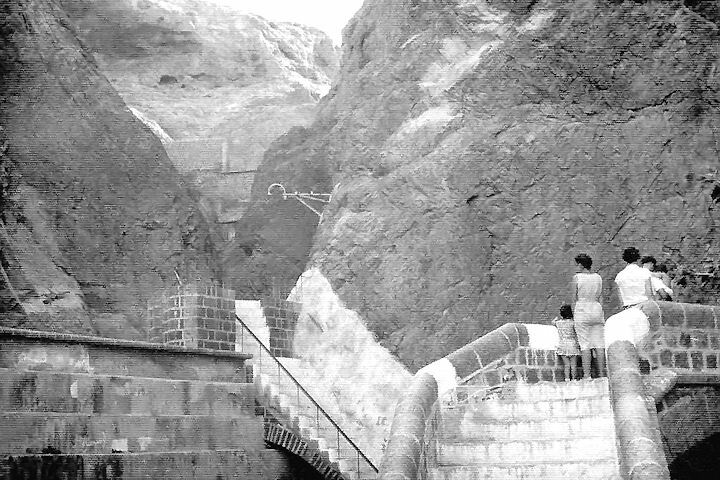 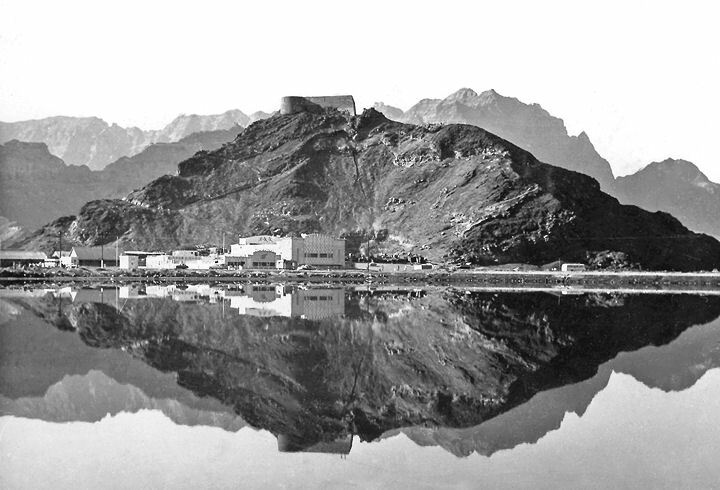 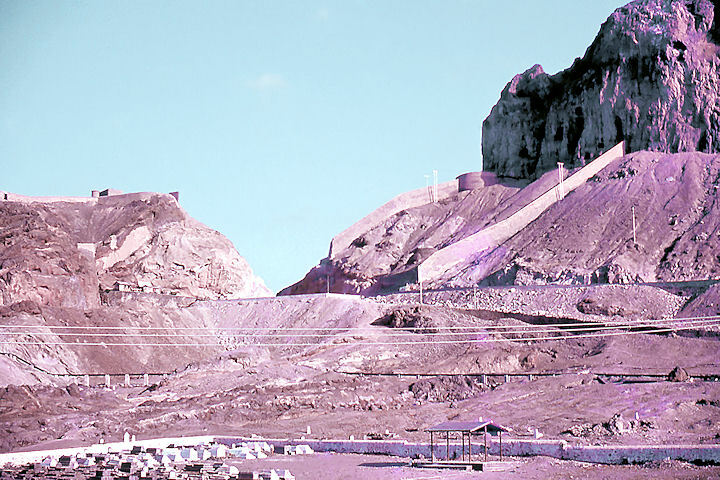 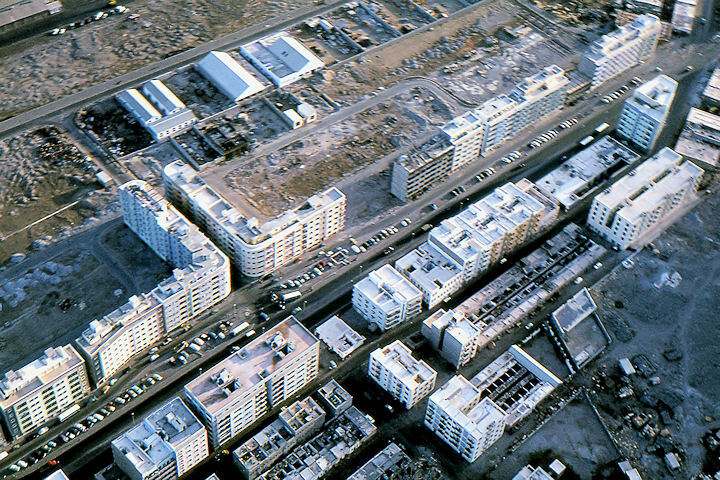 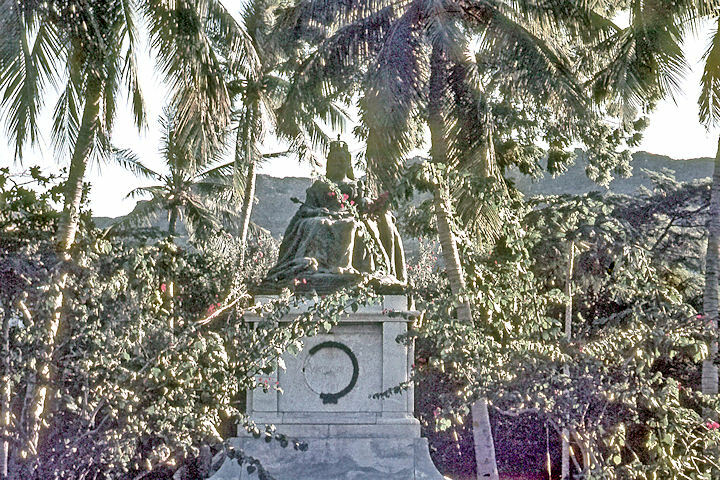 Or continue past the market to the municipal park enclosing the Tawahi Tanks – a series of vast reservoirs formed by masonry bonded on to the living rock and built by who knows what occupants of Aden in some distant century. 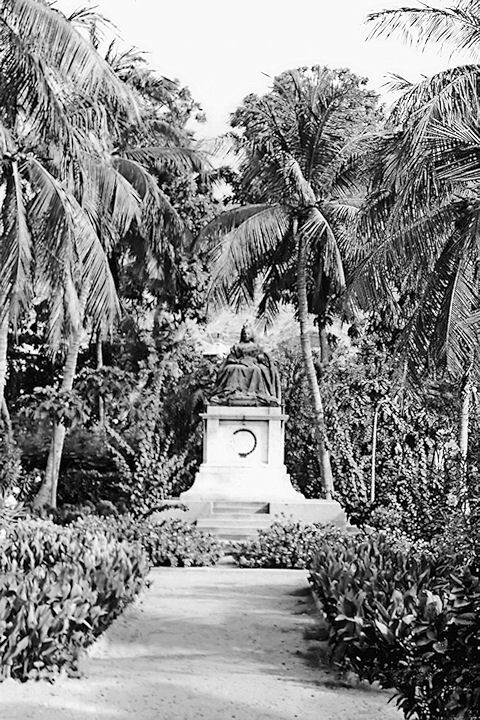 They were discovered and cleared out by a British officer in the middle of the last century, but their origin remains obscure. 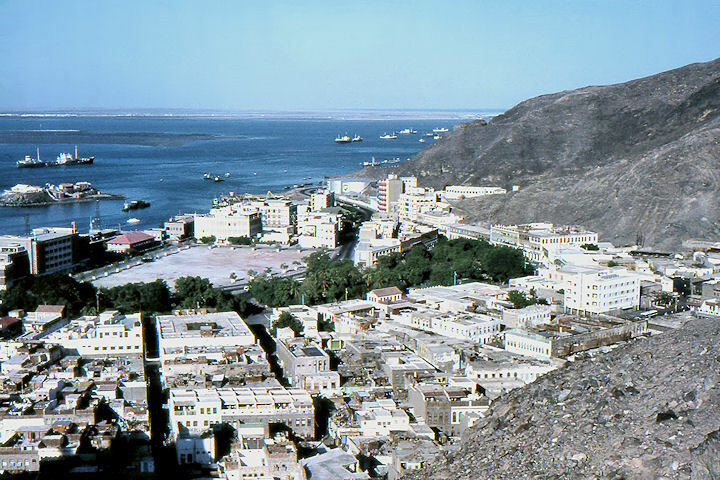 They can store many millions of gallons of water – but rain being rare in Aden, often remain dry from year to year. 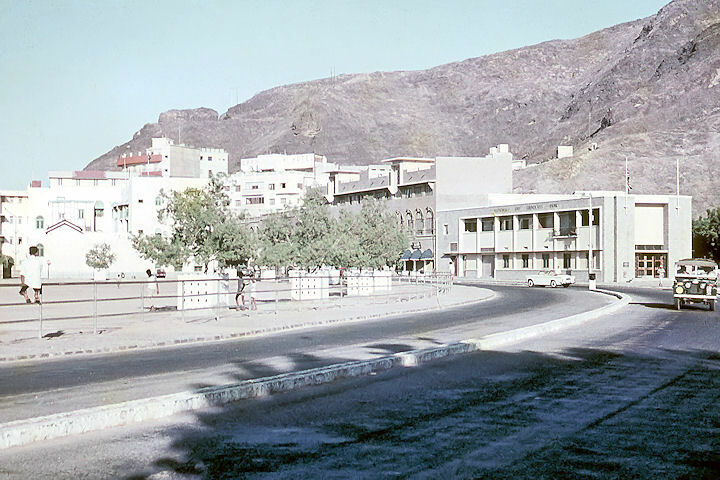 Also in this park is the little Aden Museum, built in 1930. 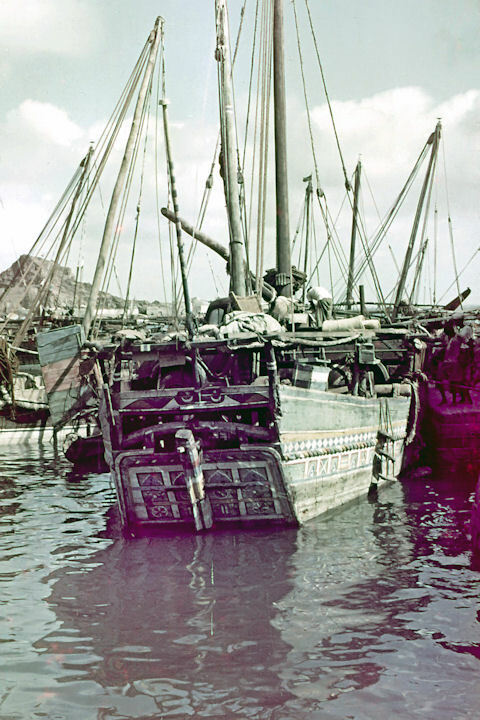 It houses various ancient coins, weapons, soapstone carvings and pieces of pottery, some examples of local crafts – handwoven cloth, indigo dye work, calico printing and pottery – and samples of frankincense, myrrh and other precious gums. 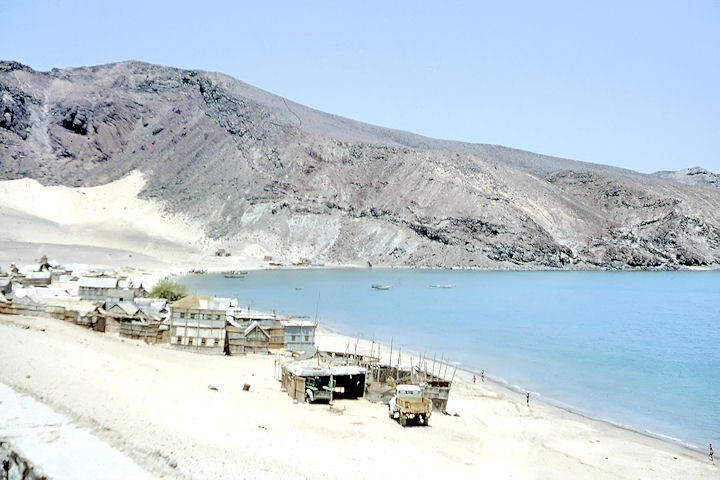 Leaving Crater by the Marine Drive gives a fine view of the little township from across the bay and, crossing the sandy isthmus, brings you back to the main road to Khormaksar and so back to Maala. 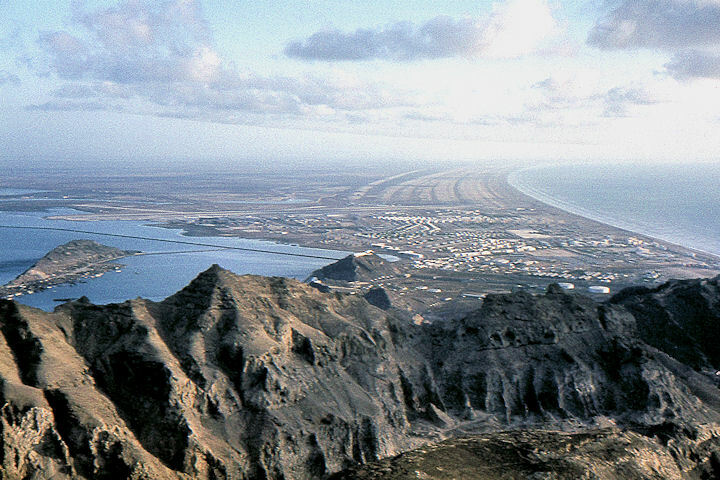 The Prince of Wales Pier to Tawahi Tanks is 6 miles and the round trip to Crater via Main Pass and back by Marine Drive is 13 miles. 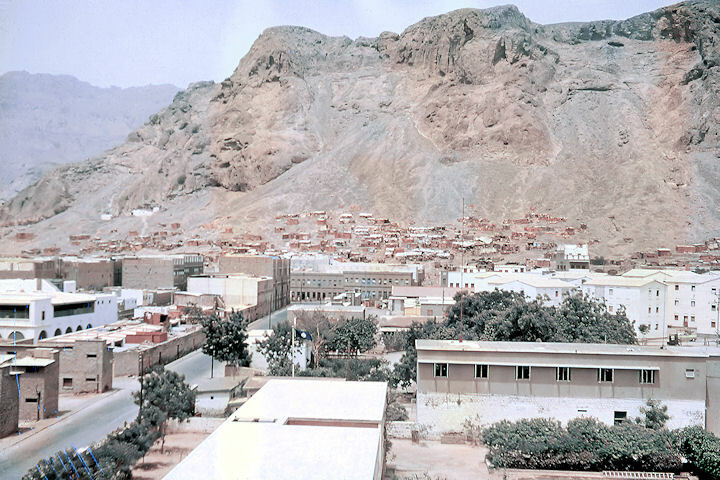 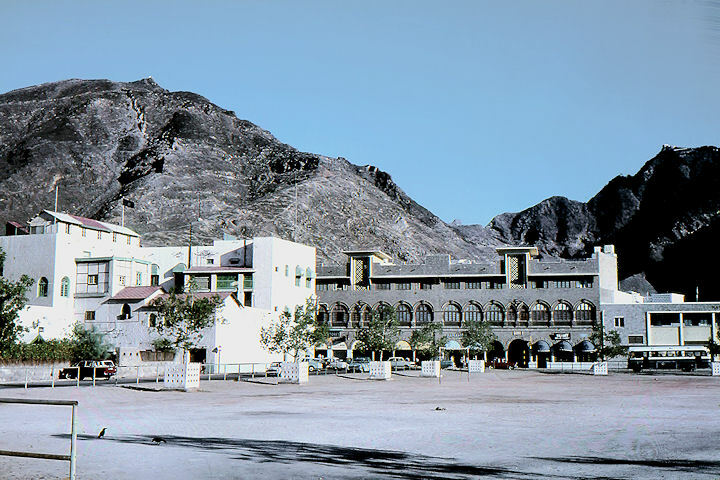 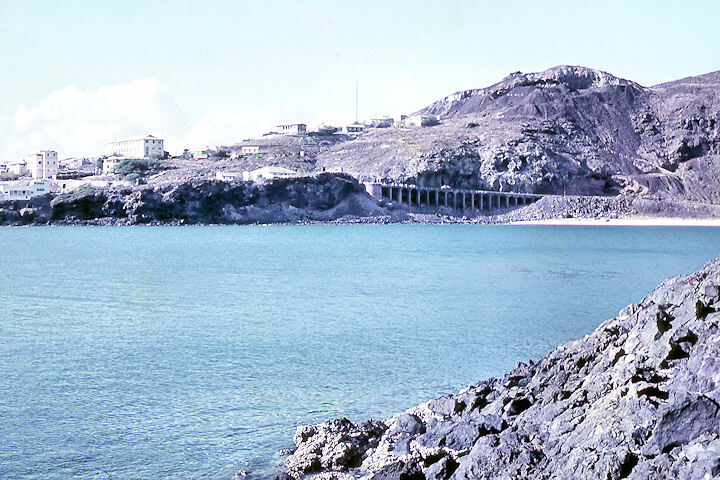 Sheikh Othman, on the boundary of the Colony and Protectorate, is an Arab town almost untouched by modernisation and is a natural oasis and since the last century, the main source of Aden’s water supply. 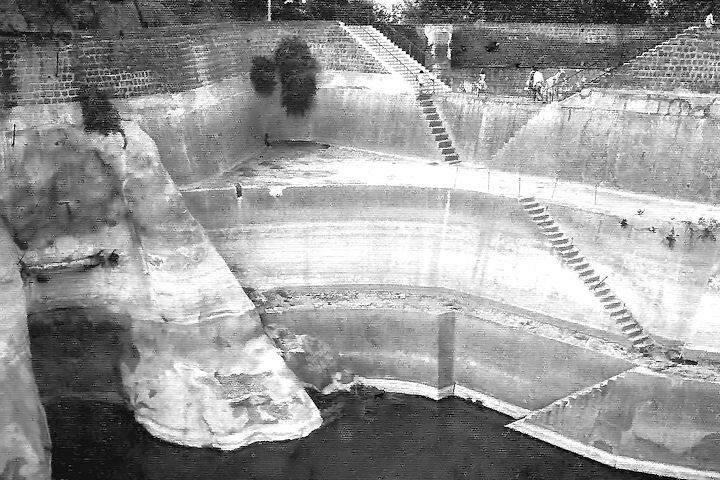 Again, a circular trip is possible. 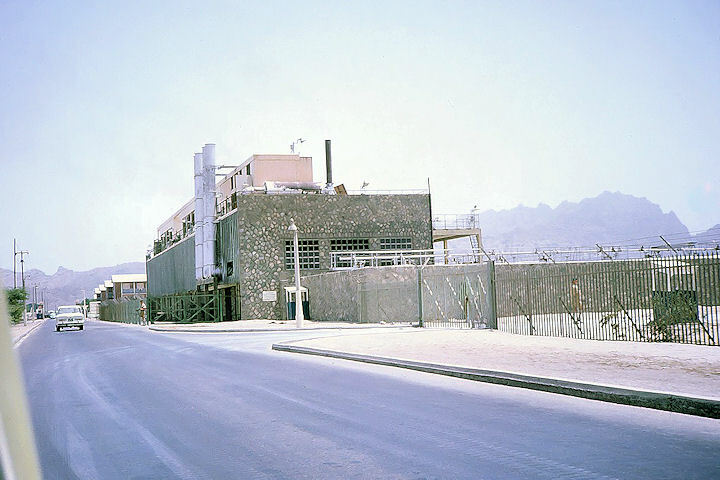 Drive out through Maala and Khormaksar, past the RAF Station and civil airport, and you come to the salt works, once a most important local industry. 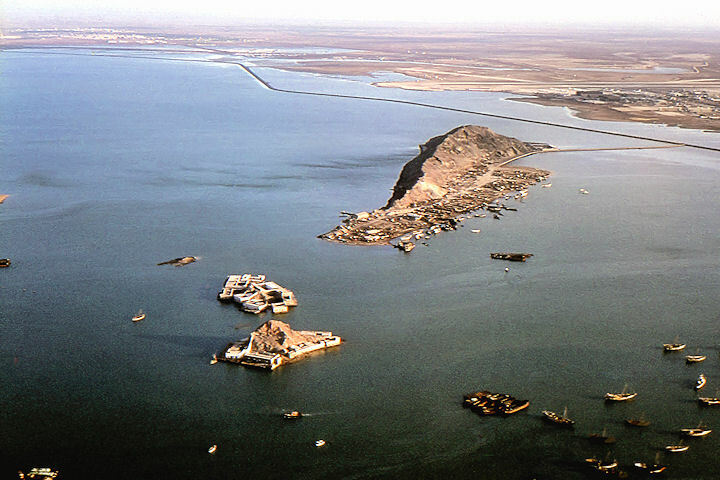 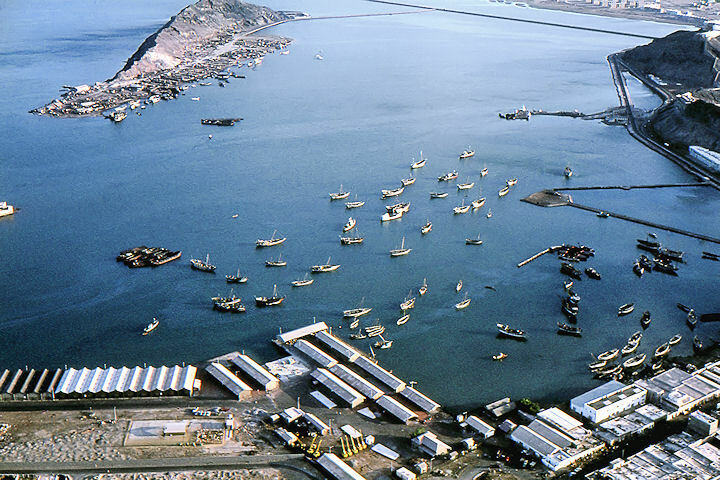 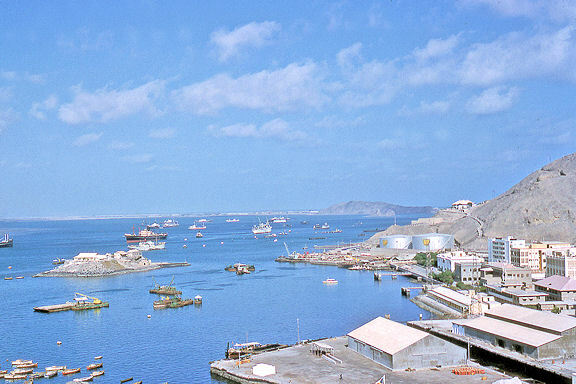 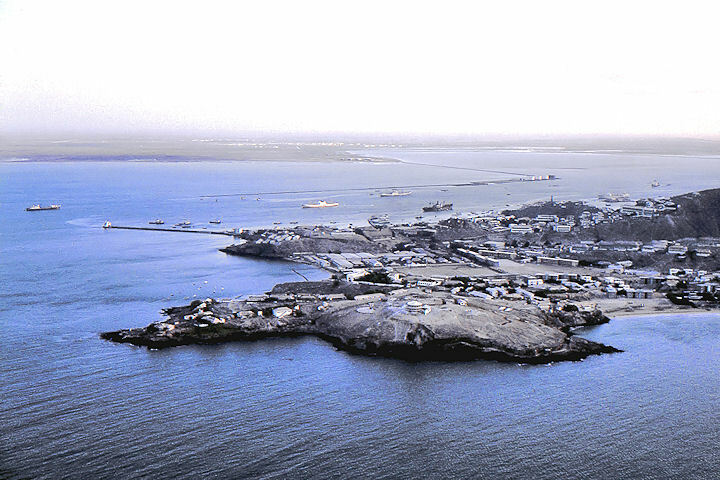 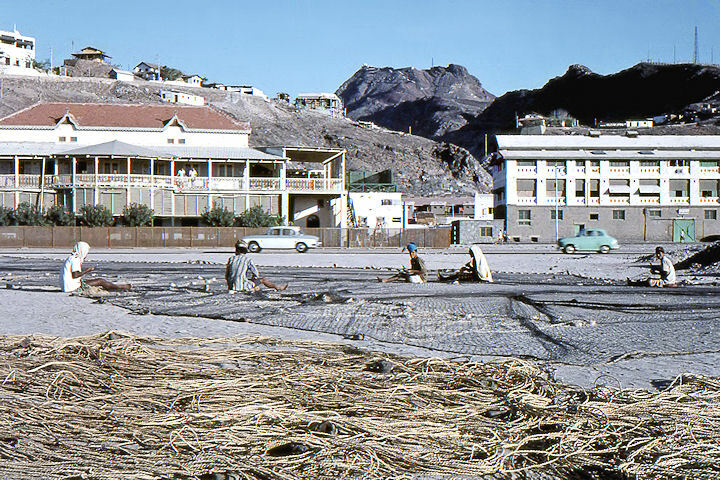 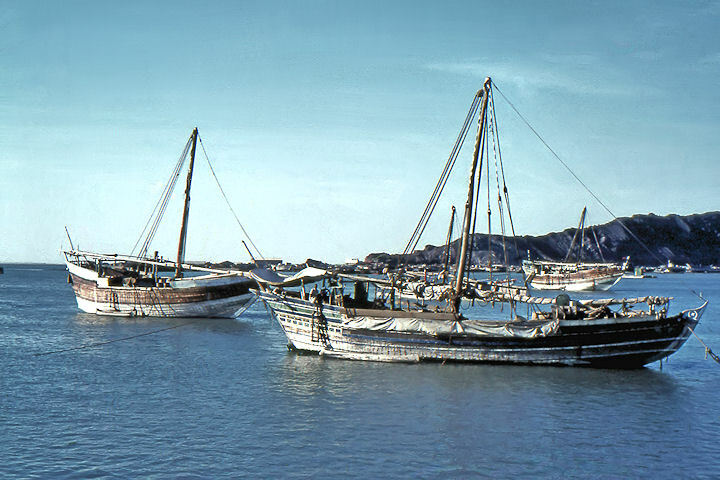 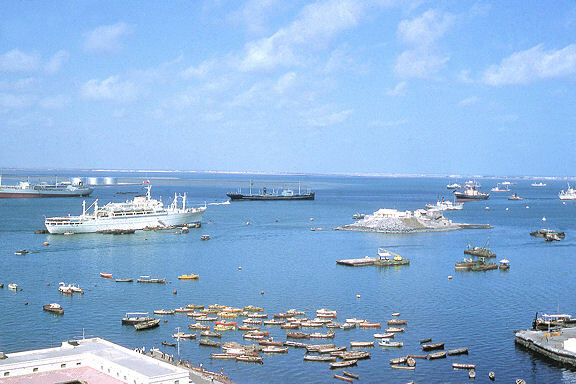 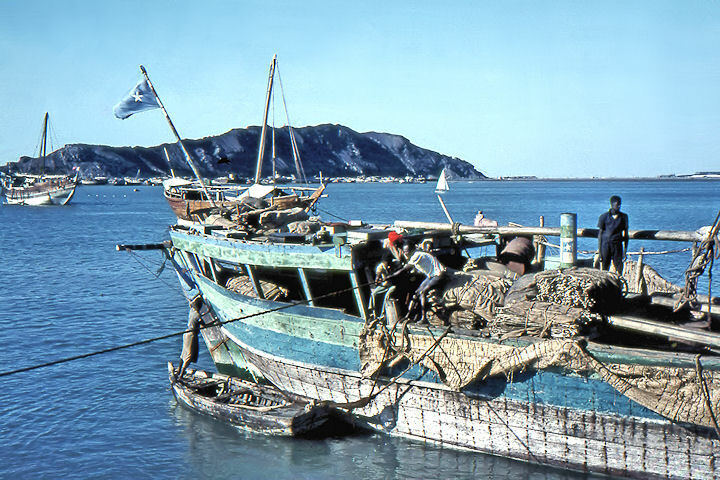 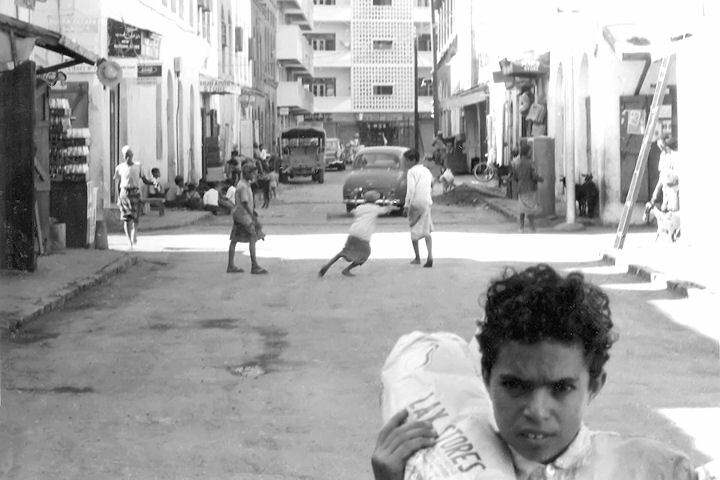 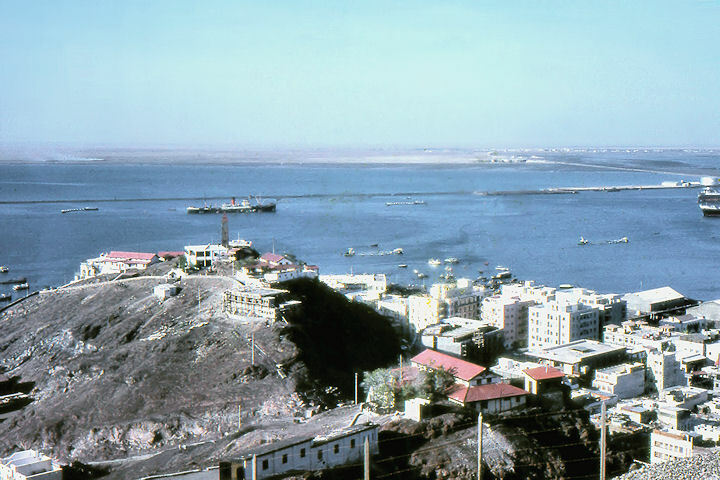 Exports are falling off, but 168,000 tons of salt were exported from Aden in 1959. 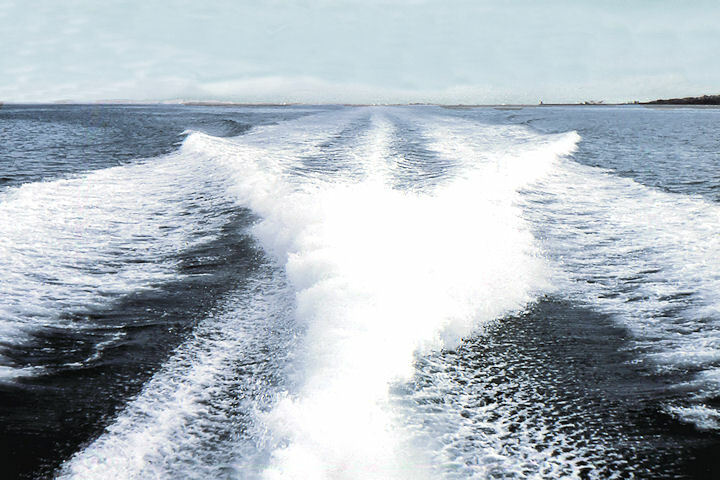 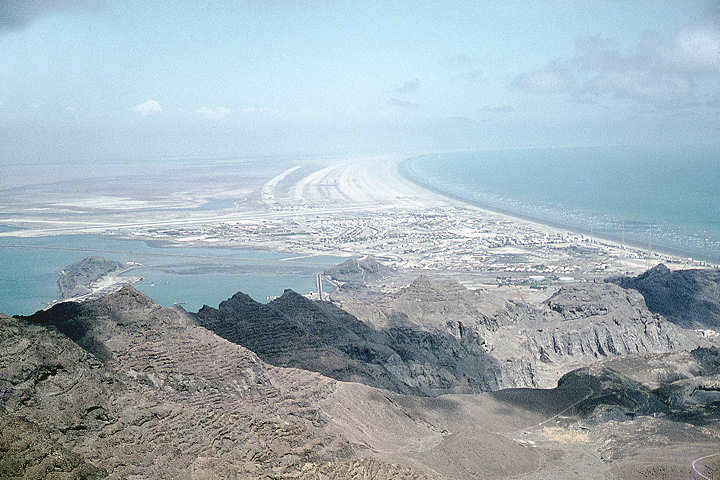 It is produced by a simple process of evaporation – sea water is pumped into the 3,682 acres of shallow salt pans and left to evaporate in the hot sun, leaving the salt behind. 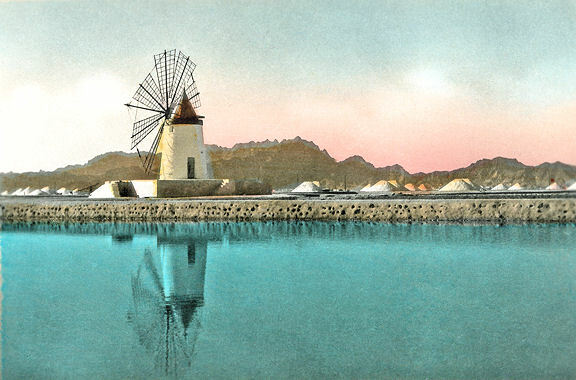 Pumping is done by windmill, and the flat landscape with its windmills has a look of Holland and is a great attraction to local artists. 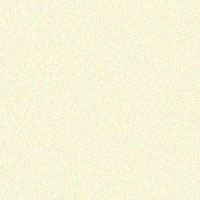 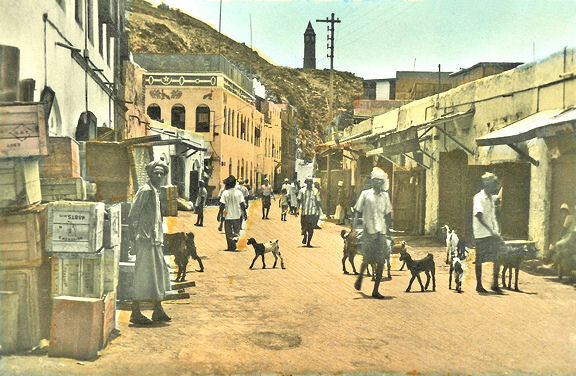 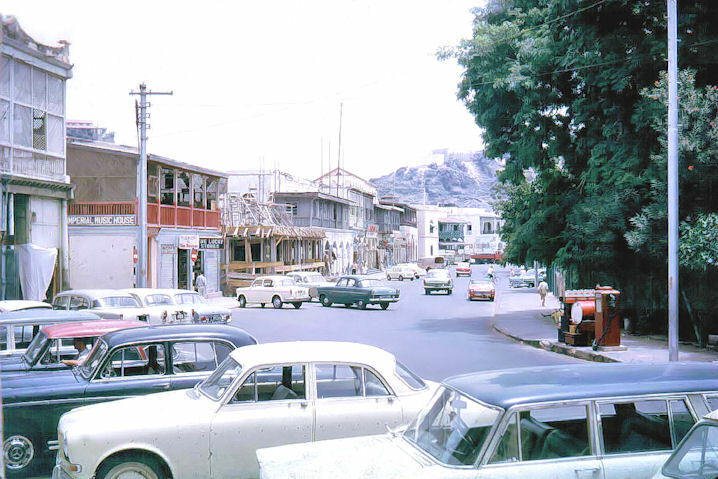 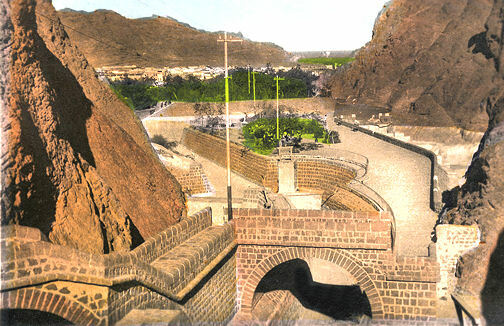 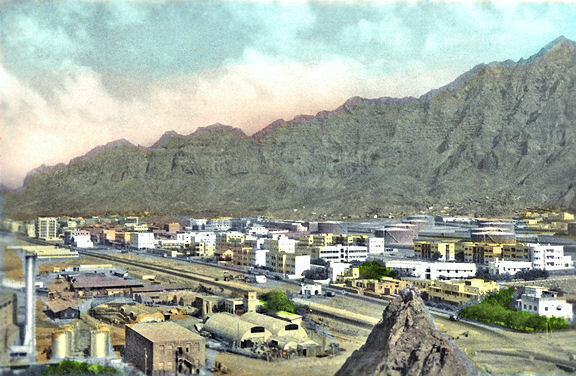 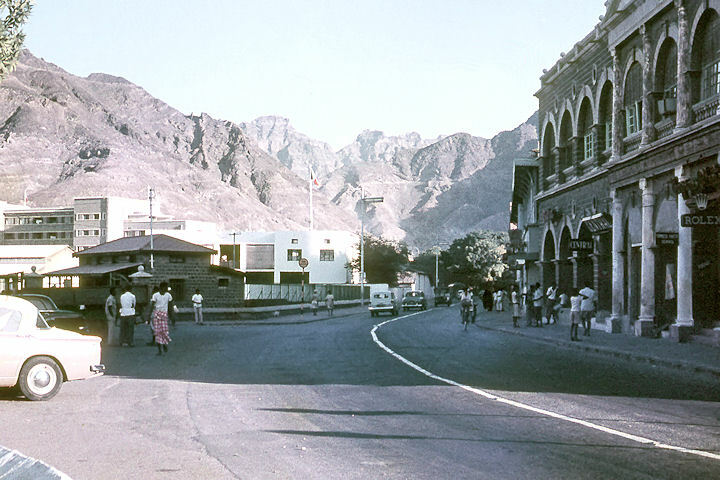 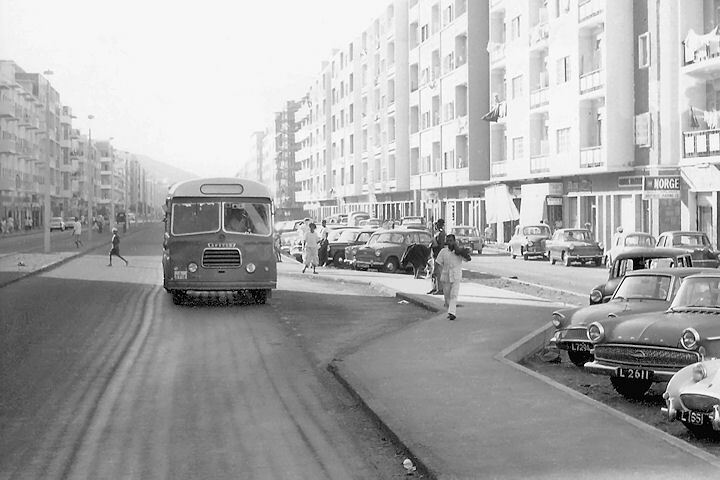 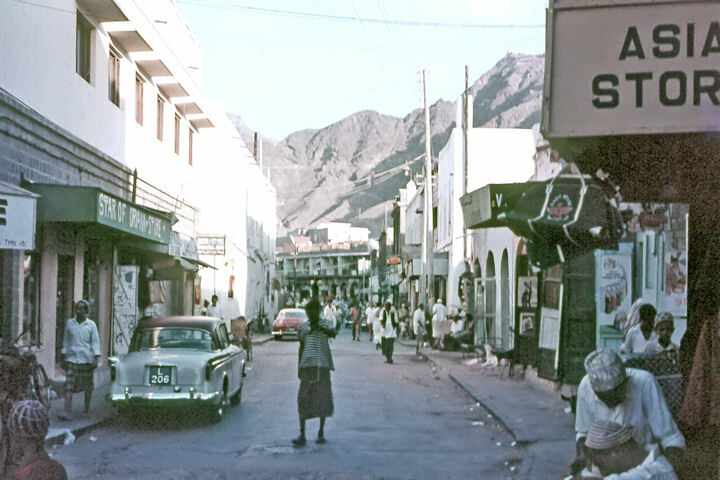 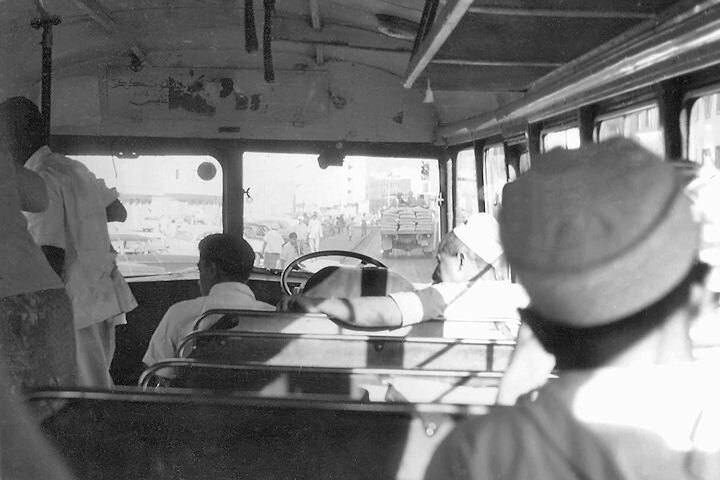 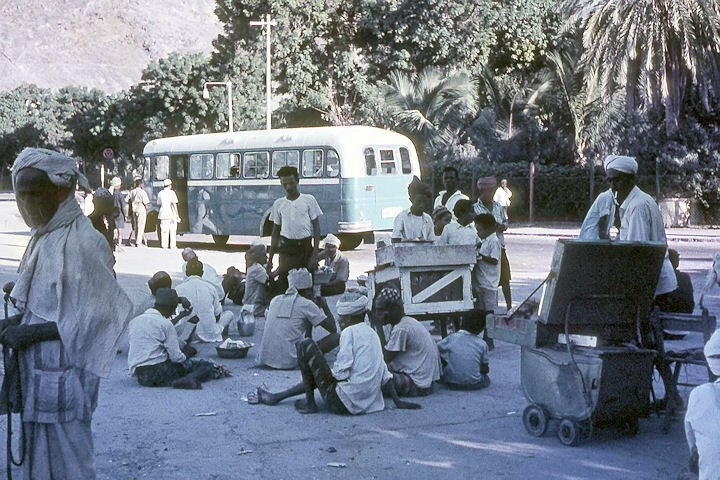 The road continues past the Aden Protectorate Levies camel lines and then comes the first sight of green bush in Aden. 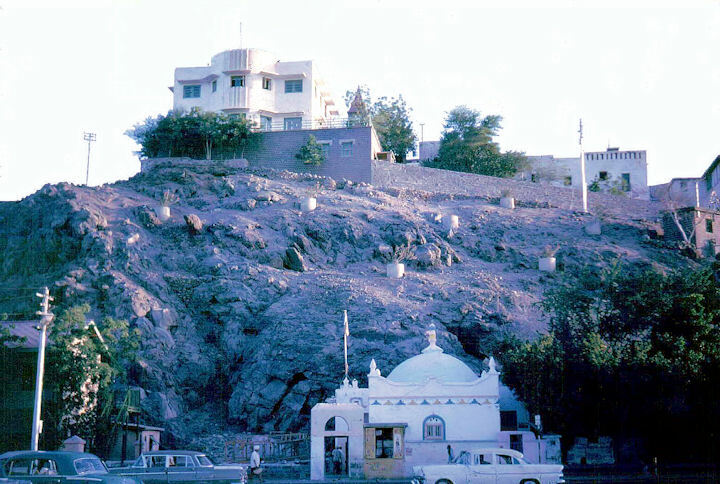 On the outskirts of Sheikh Othman a little mosque crowns a hill: turn off near here and head for the open desert if you want to see the potters at work. 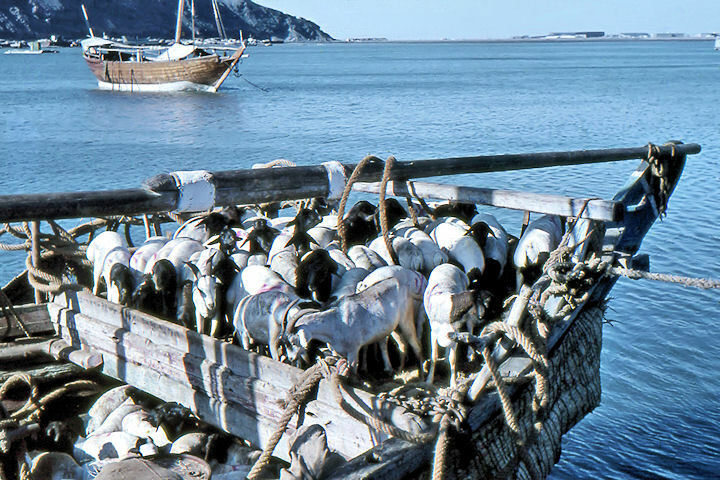 This ancient local craft dates from before the invention of the potter’s wheel, so the craftsman walks – or, for larger vessels, runs – round the table on which stands the clay he is shaping. 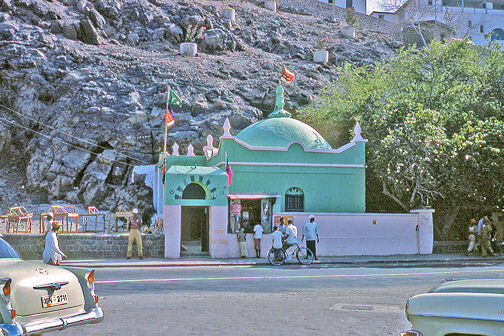 Also near the mosque can be found the Aden Zoo – a small private collection of animals from Africa and Southern Arabia, including; lion, cheetah, monkeys, foxes, python and ostriches. 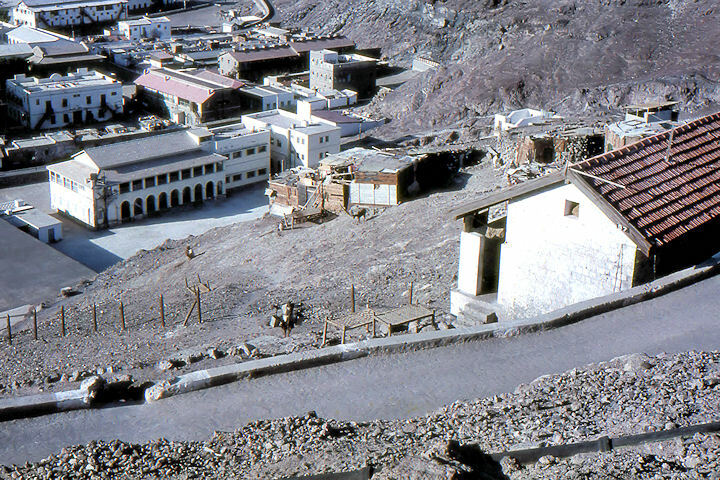 Admission is -/50. 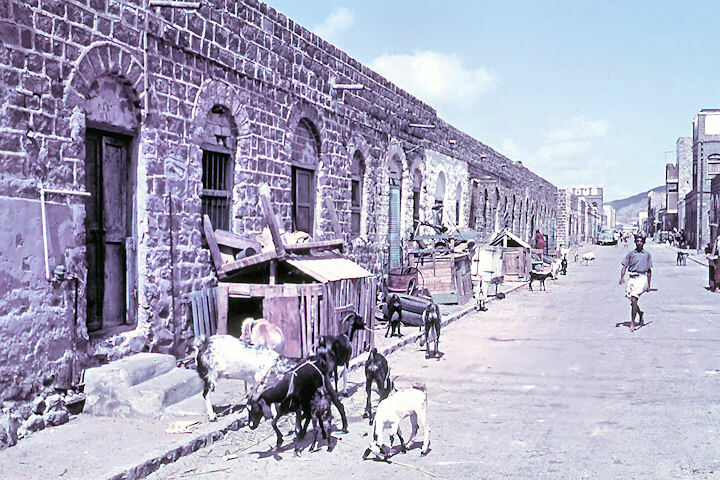 In the streets of Sheikh Othman goats wander, untethered and untended, at will. 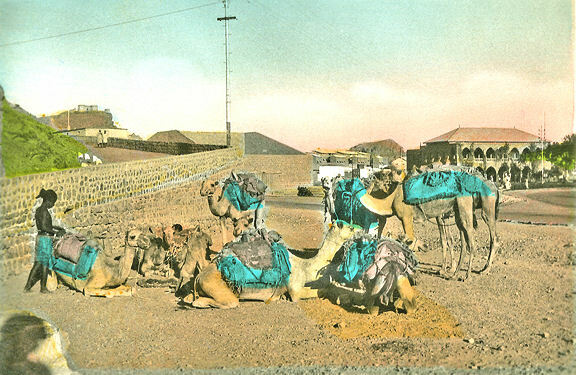 Here you may see the camel caravans that bring produce across the desert from the hills up-country. 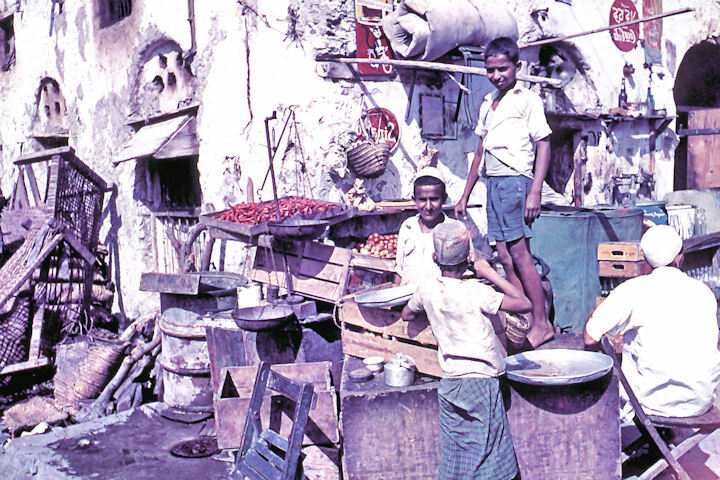 And here, too, is carried on another local industry, cloth dyeing. 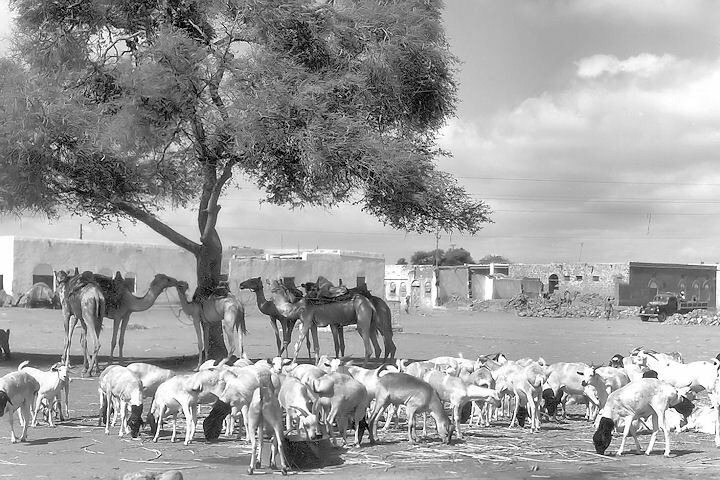 But Sheikh Othman is chiefly famous for its gardens, both private and public, for this is an oasis with plentiful wells and boreholes. 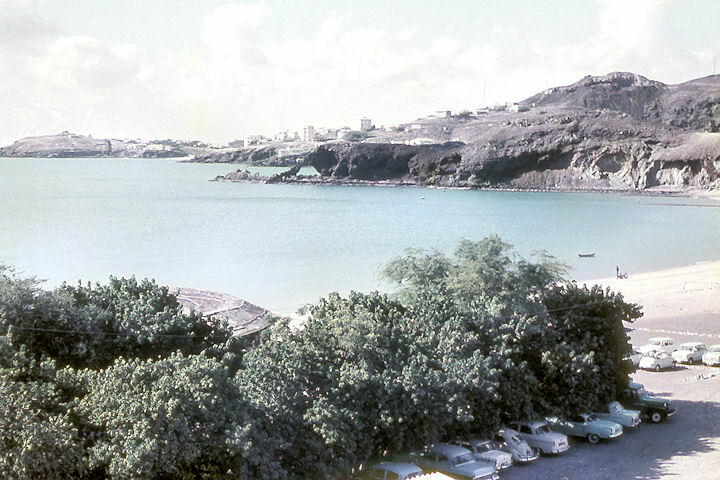 The township gardens are 47 acres in extent, bright with flowering shrubs and cannas, cool-looking with shade trees and even grass, while water flows everywhere in ditches. 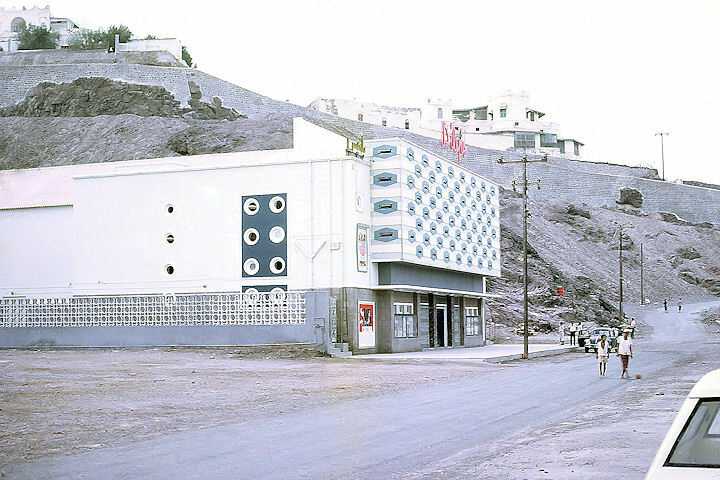 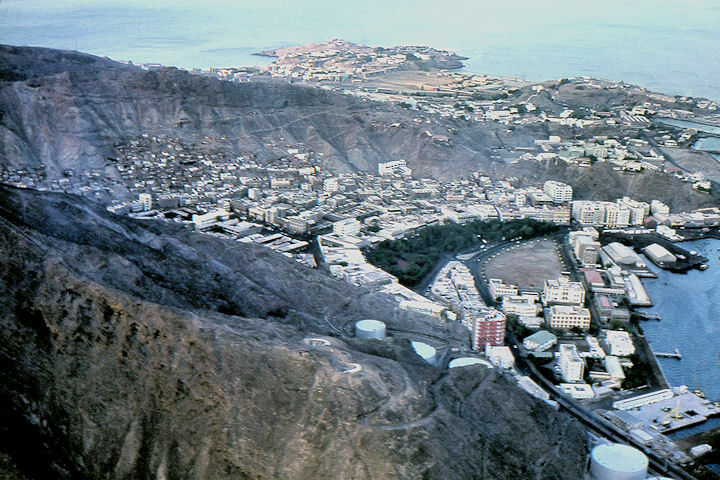 Leave Sheikh Othman by the opposite direction from that you entered and continue across the desert (and past two new cinemas) to the roundabout where the road meets that to Little Aden. 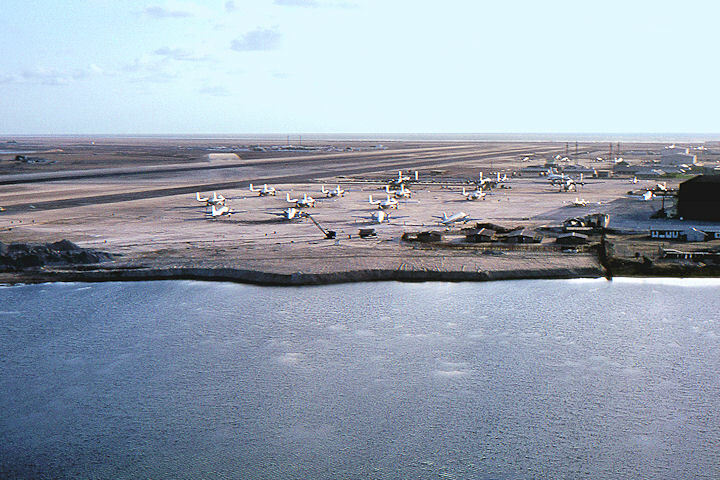 From here, return to Maala via the causeway road that passes near Slave Island, where you may see flamingos wading in the shallow lagoons off the end of the airport runway. 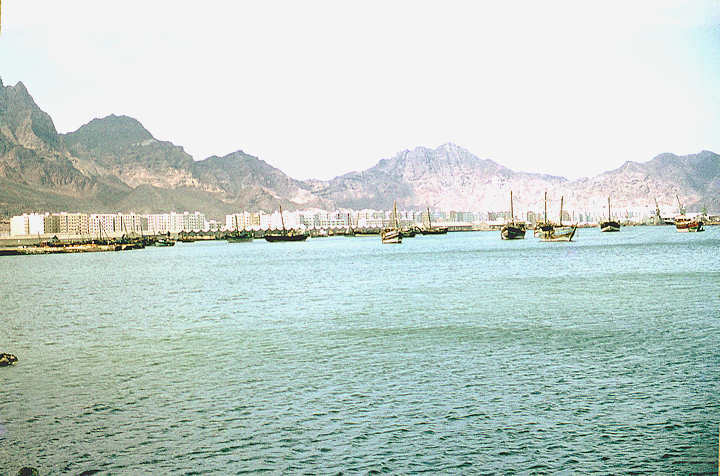 The distance from Steamer Point to Sheikh Othman, via Khormaksar and Champion lines is 13 miles and the return by causeway road is 10 miles. 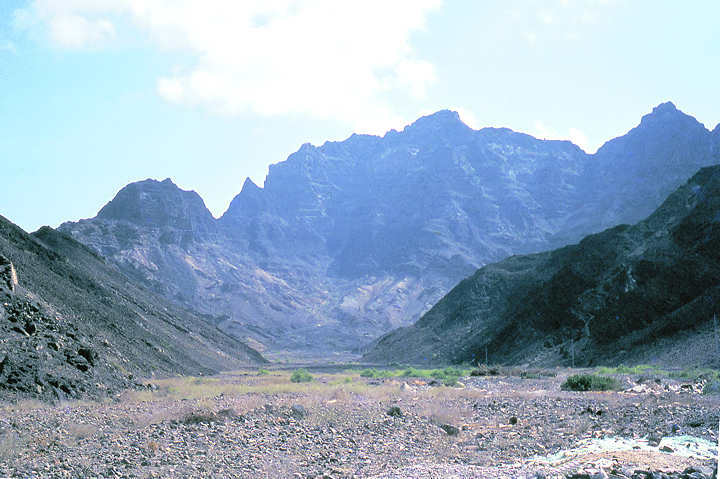 A round trip, including the gardens, is 24 miles. 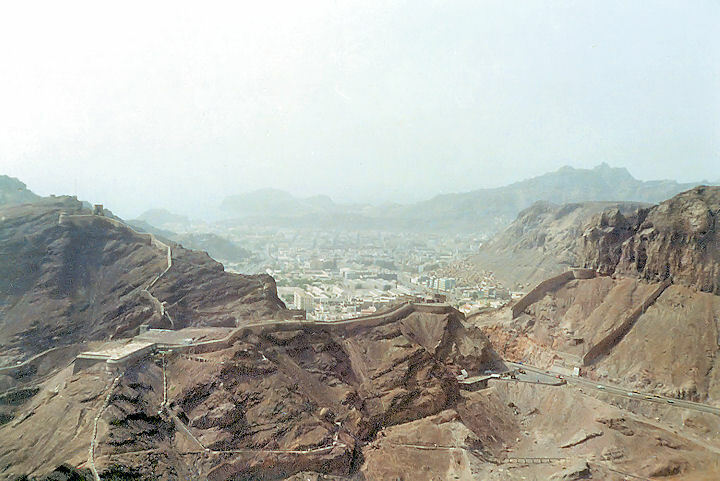 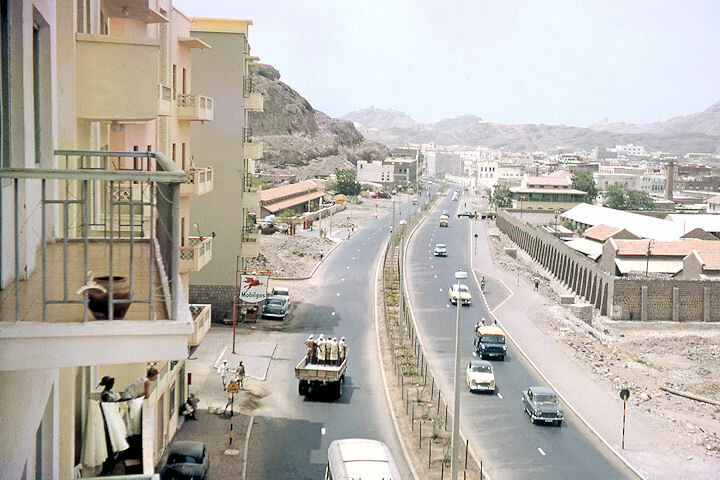 This, the longest road in Aden, can be combined with the trip to Sheikh Othman. 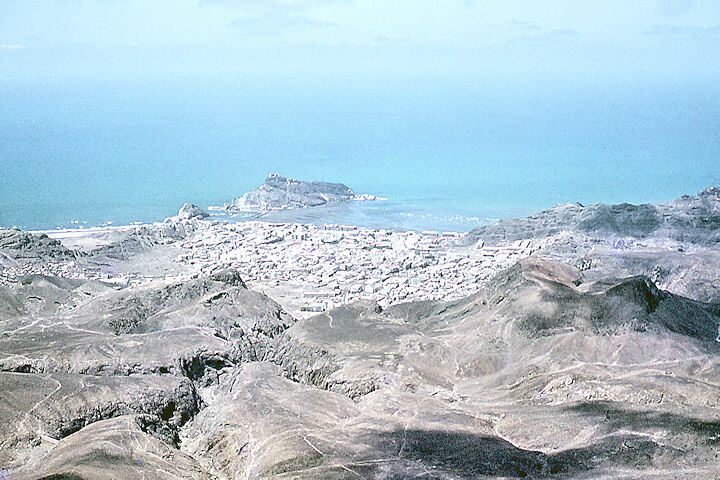 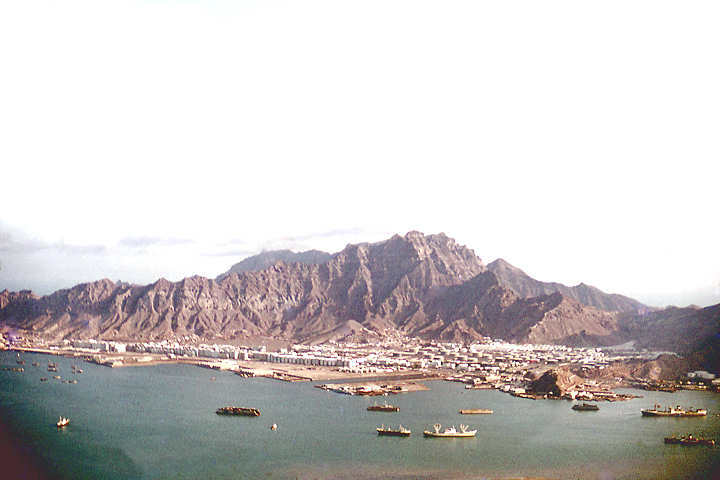 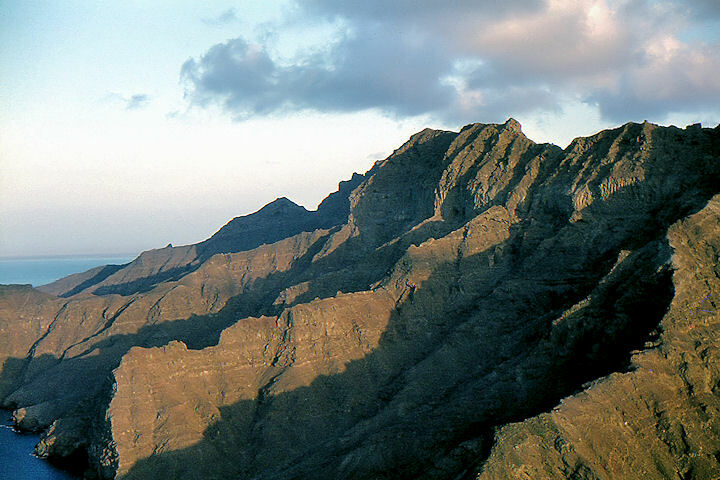 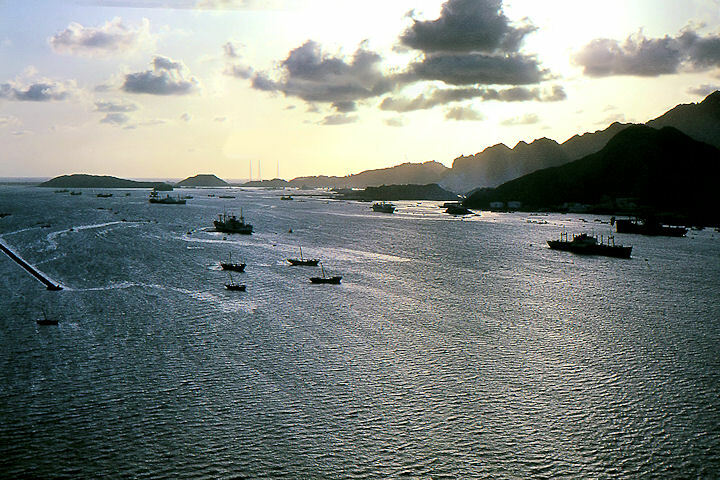 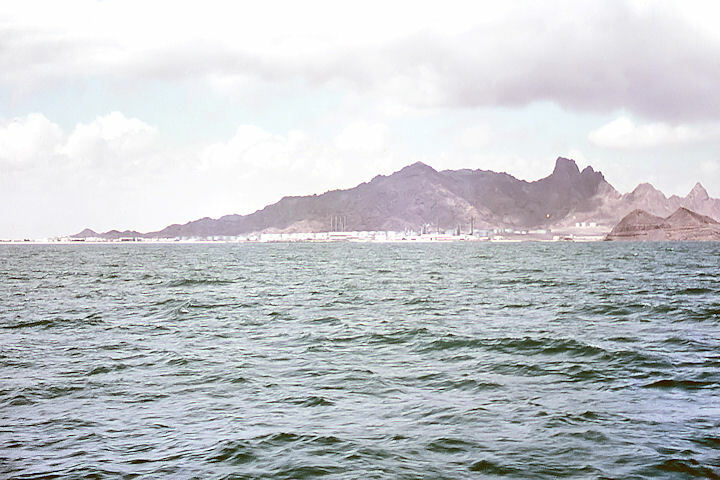 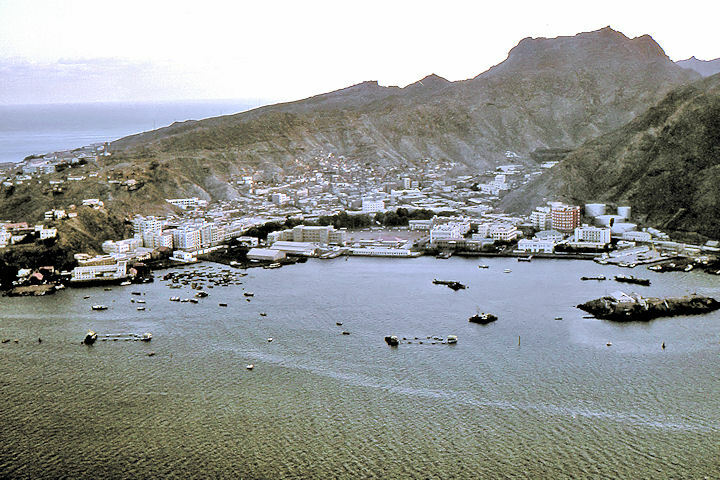 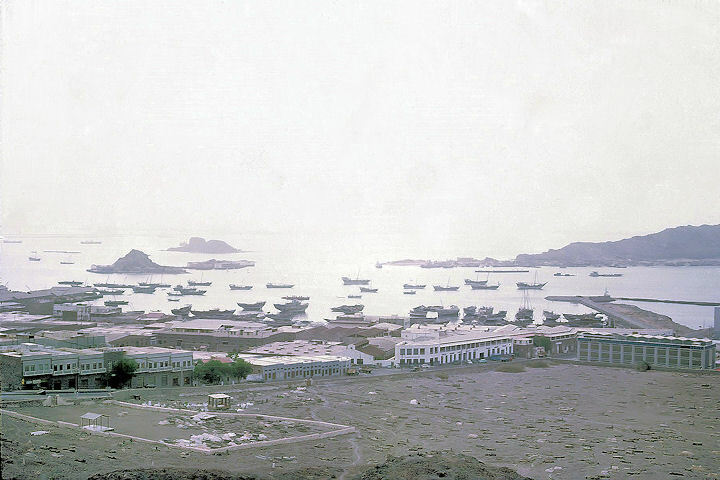 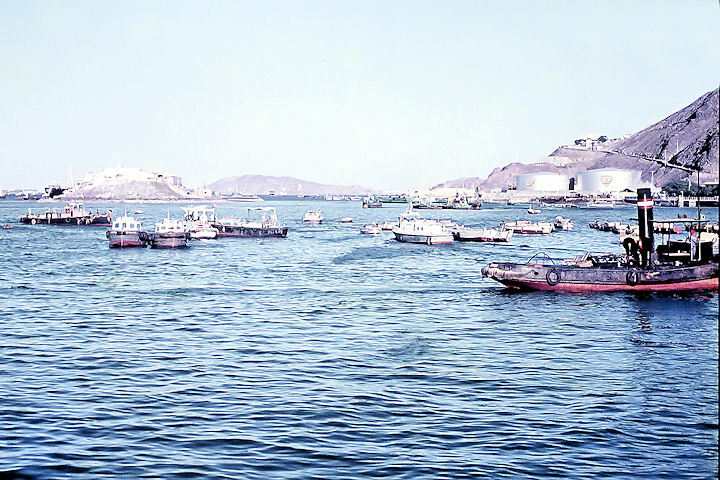 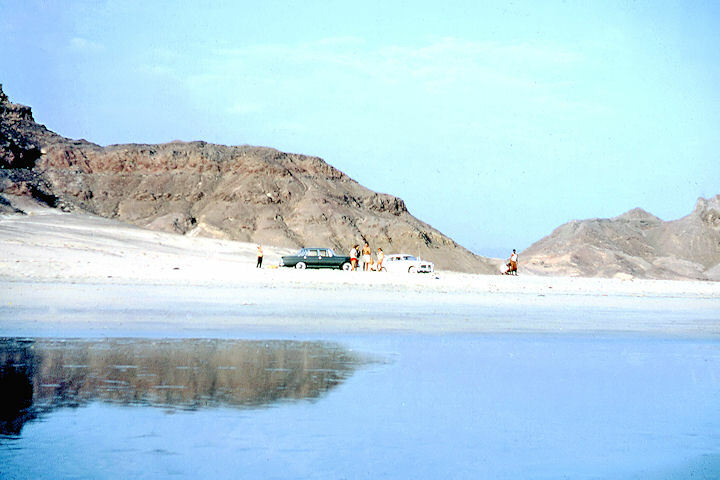 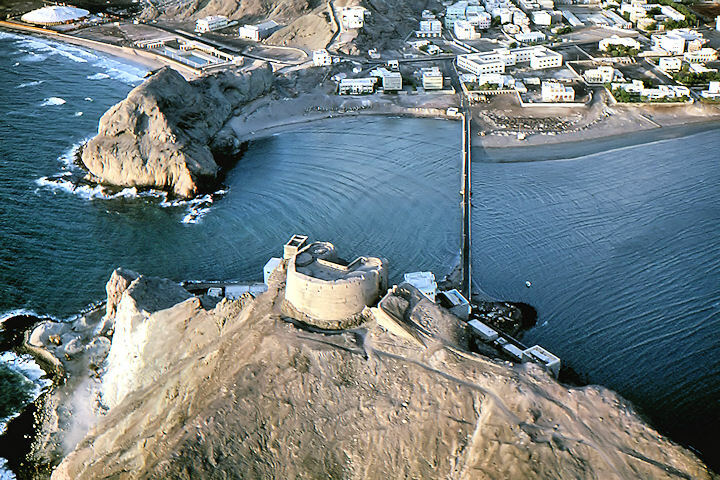 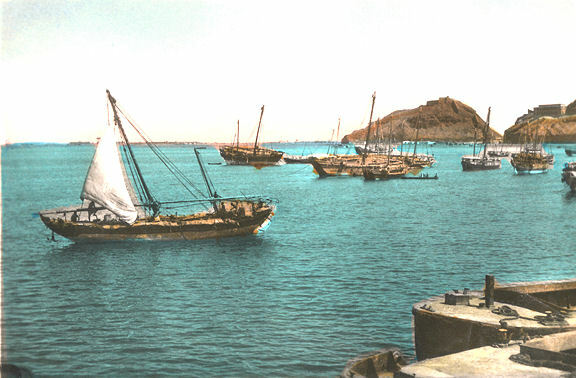 From Steamer Point and Maala it is usual to take the causeway road which, after meeting the Sheikh Othman road, continues along the sandy shore of the bay, giving distant views of the barren rocks of Aden proper. 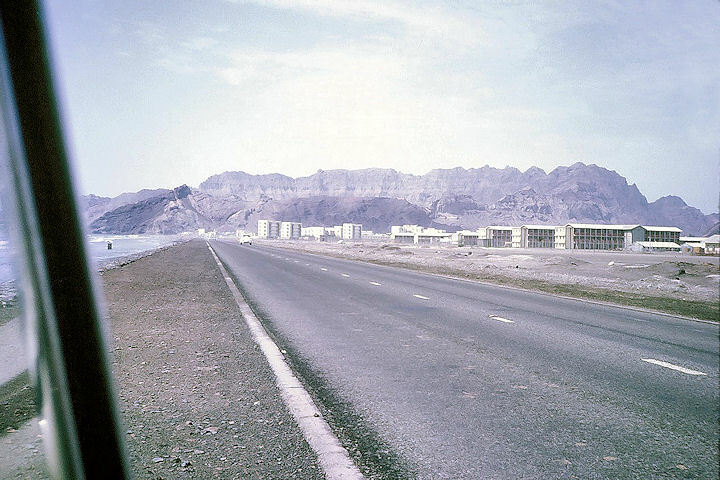 After a few miles empty sand gives way to camel thorn, palm trees and a small village, then, on the right of the road can be seen the beginnings of the new city of Al Ittihad, the headquarters and ministerial residences of the Federation of Arab Amirates of the South, for here the road touches the Protectorate border. 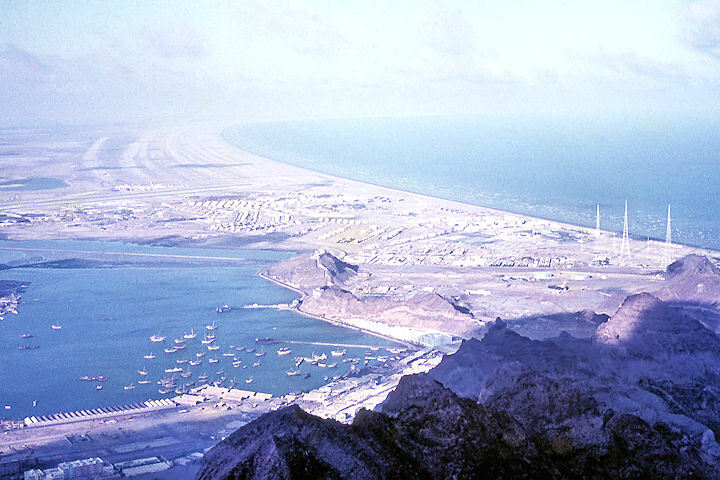 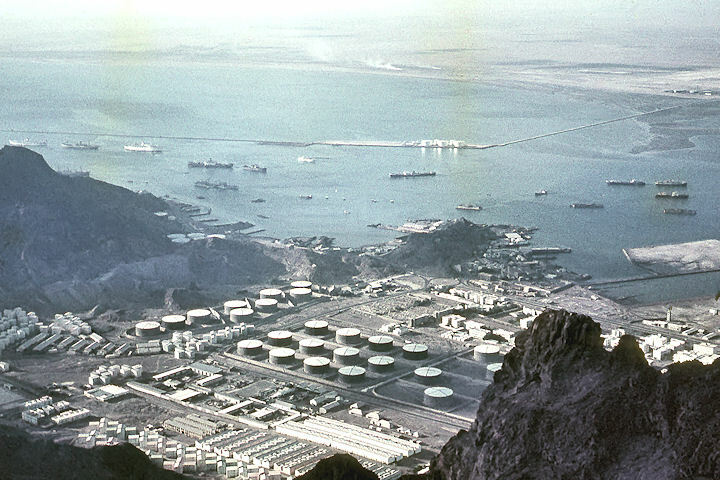 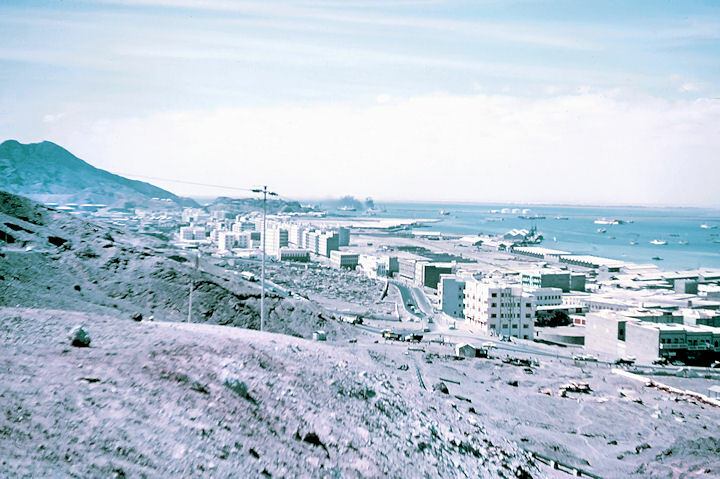 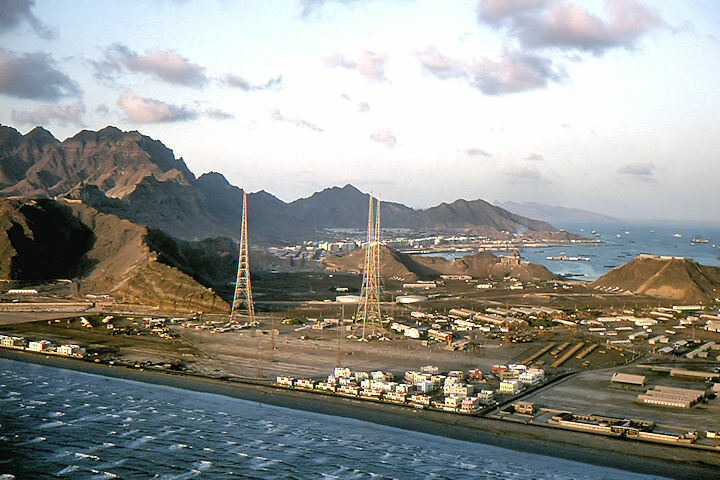 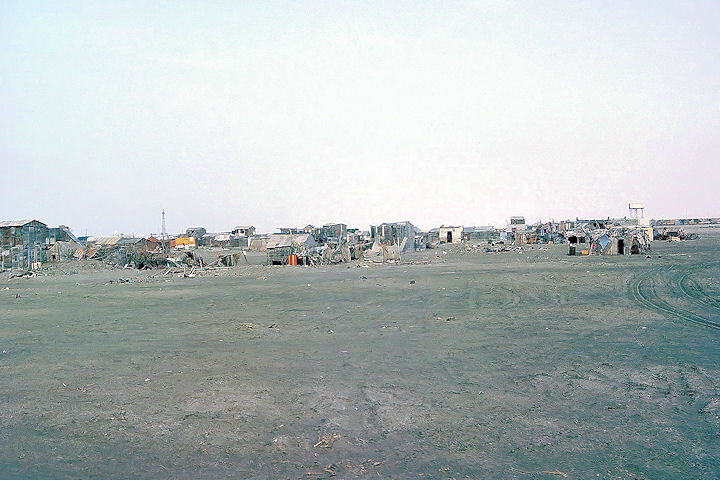 It continues straight across the desert to cross an inlet creek and enter Little Aden, where the oil harbour, employees’ housing and refinery proper spread out over a wide area. 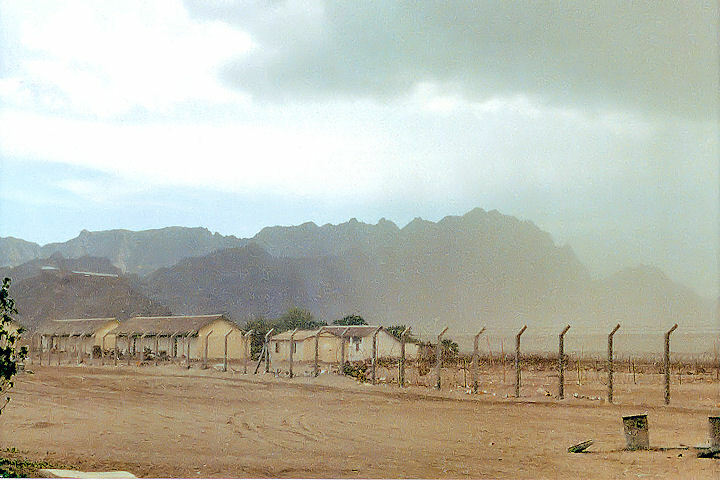 Beyond the refinery the way leads through Silent Valley, so named because no radio will operate there, and past a growing Army camp. 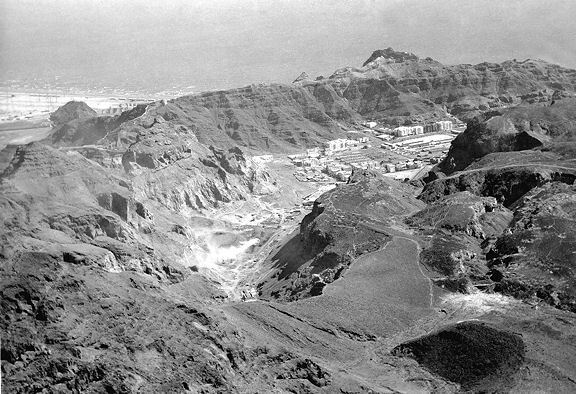 The end of the road is at Bir Fuqum, with a few refinery houses on a rocky ridge. 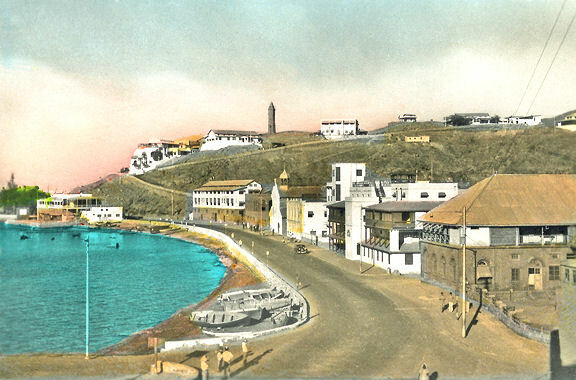 Below, a little bay shelters a fishing village with curious, two-storey packing-case houses, sailing boats drawn up on the beach and hordes of raggedly picturesque children. 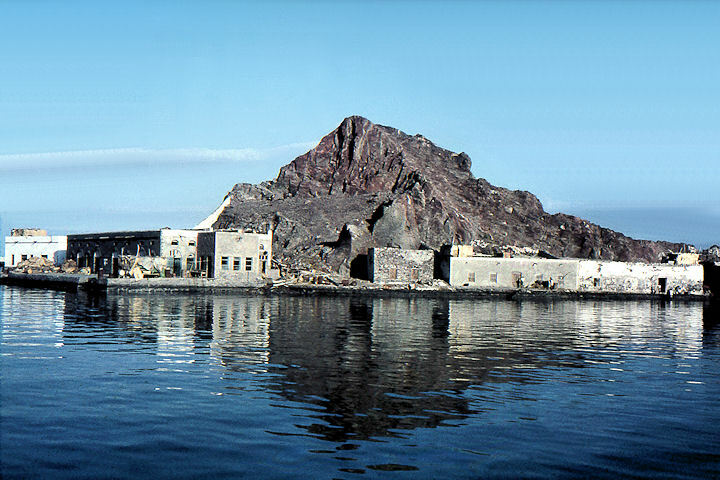 The distance from Steamer Point to Little Aden is 20 miles and from Little Aden to Bir Fuqum 7 miles. 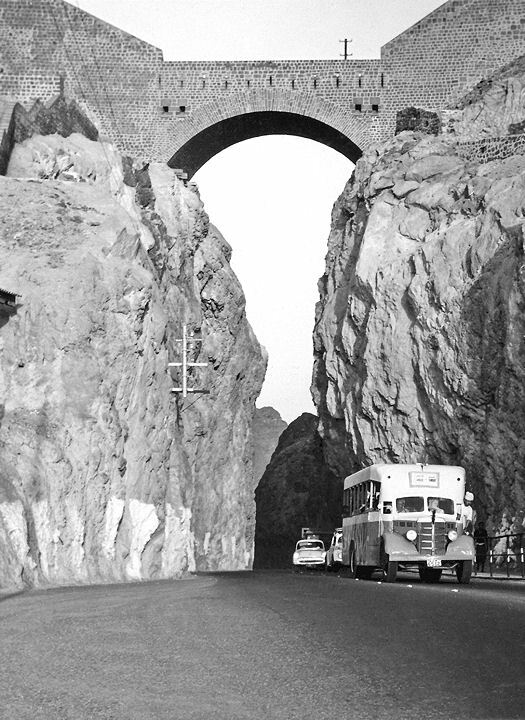 The round trip is 54 miles. 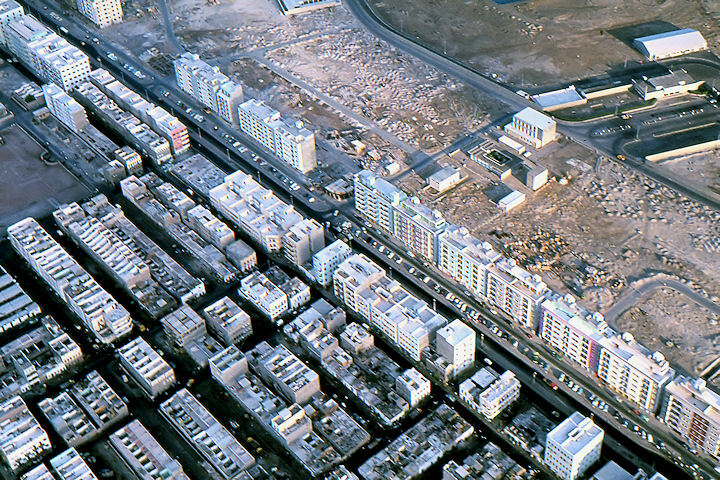 The photograph was taken from the roof of Pioneer Block overlooking the Astra Cinema and floodlit football pitch. 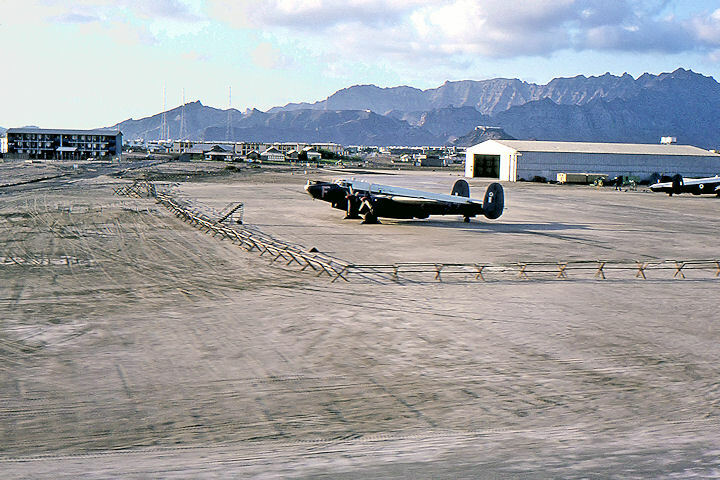 Several airmen can be seen walking nonchalantly in the direction of the swimming pool. 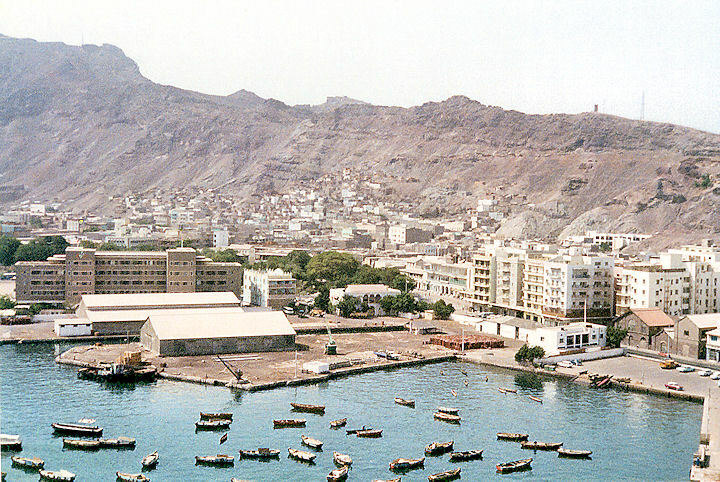 This is the view of the harbour taken from his room. 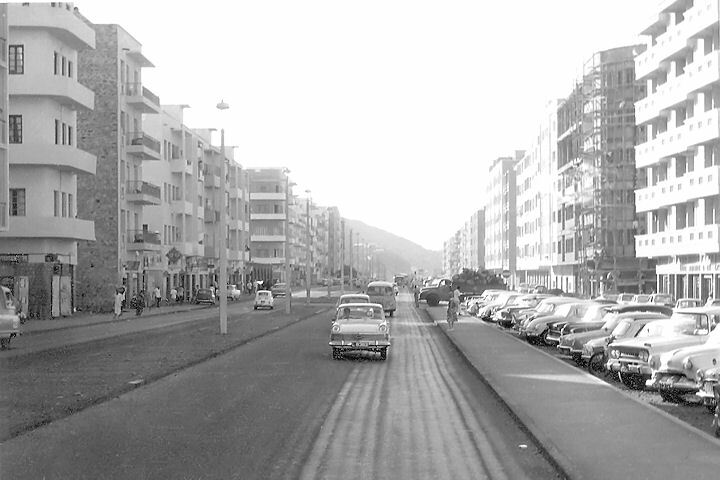 Many of the flats on either side were hirings for military personnel and their families. 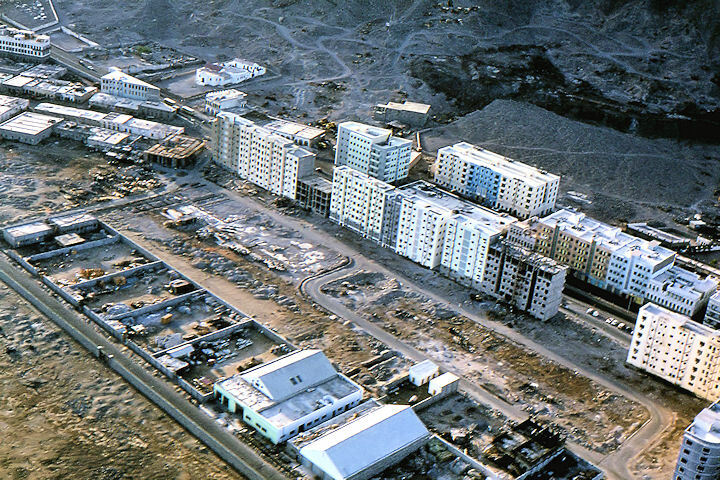 Of note is the rickety wooden scaffolding on the new construction on right. 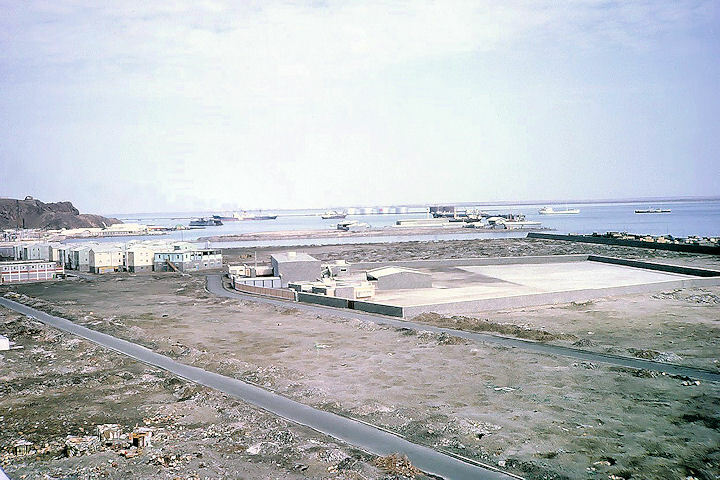 This whole section of land was reclaimed from the sea in the early sixties. 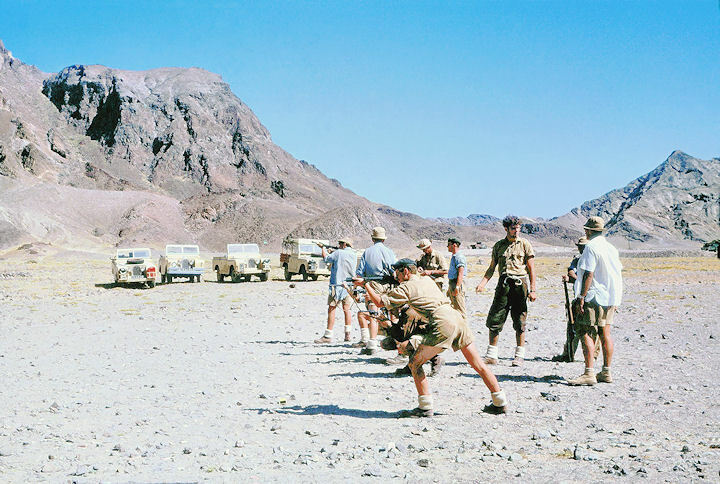 A pilot on Valettas with 233 Squadron, Keith’s tour at Khormaksar covered the years 1961-62 and being a keen photographer, he made the most of the rare opportunities to take shots such as those depicted below. 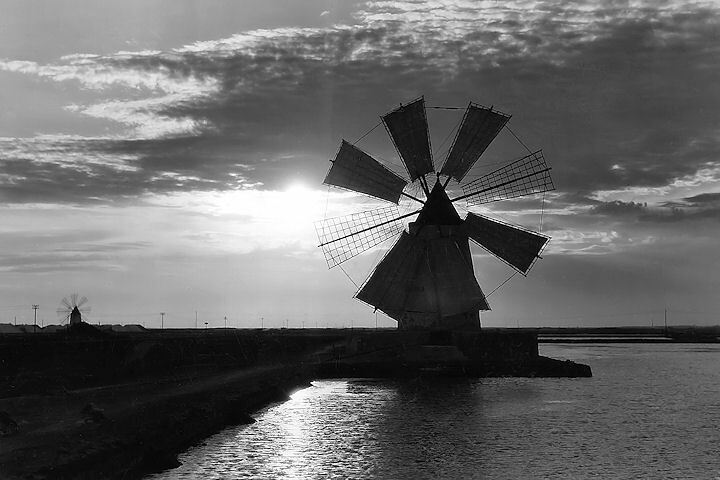 Many more of Keith’s photographs are contained in other pages, details of which can be found on the Update Log page. 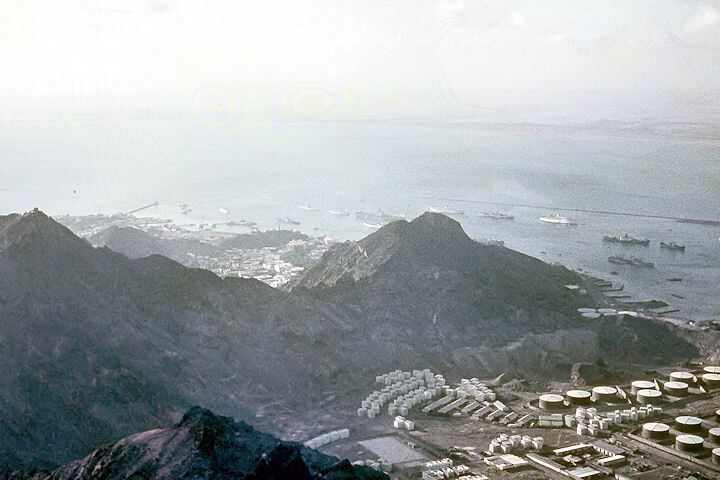 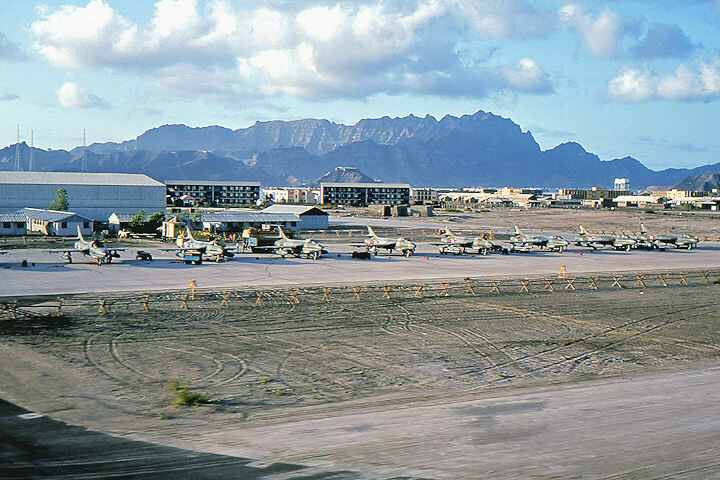 Soon after dawn a few weeks before his tour ended, Keith took his camera for a low-level ‘jolly’ round Shamsan in one of the S&R Flight Sycamores and captured images of the mountain and colony from angles that few will have experienced. 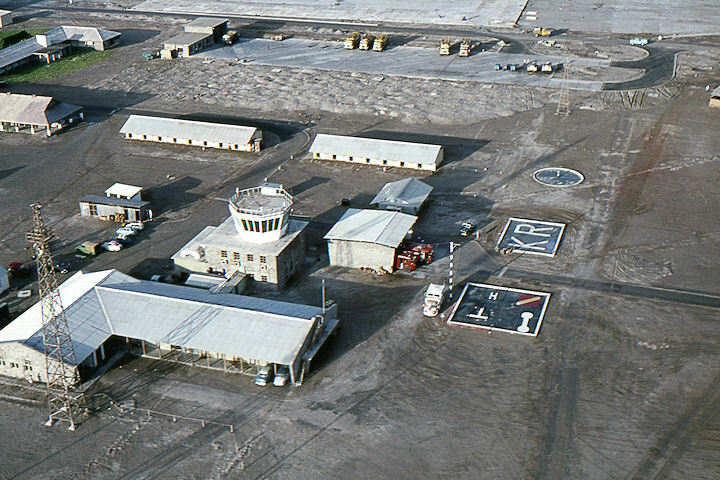 The pilot for this sortie was Flt Lt Denis Keyes. 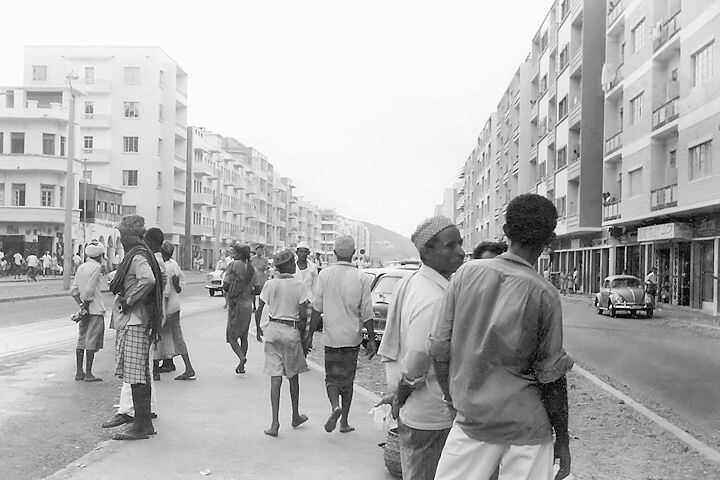 ..... before flying low along the one-mile dual-carriageway that forms Maala Straight. 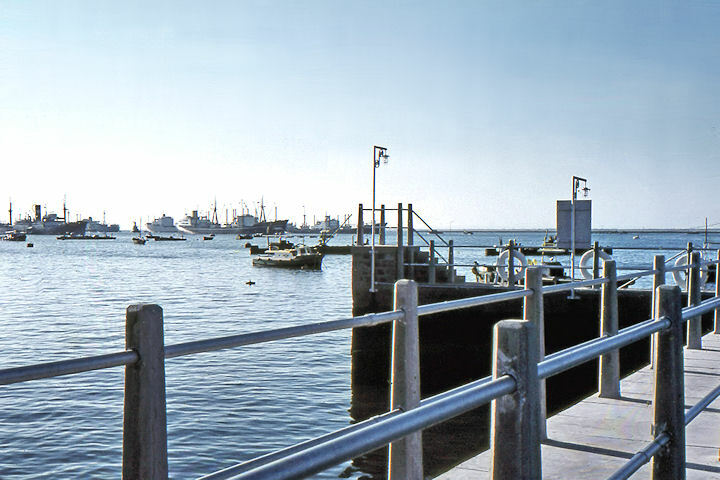 The S&R jetty at Obstruction Pier is located near the top right of the photograph. 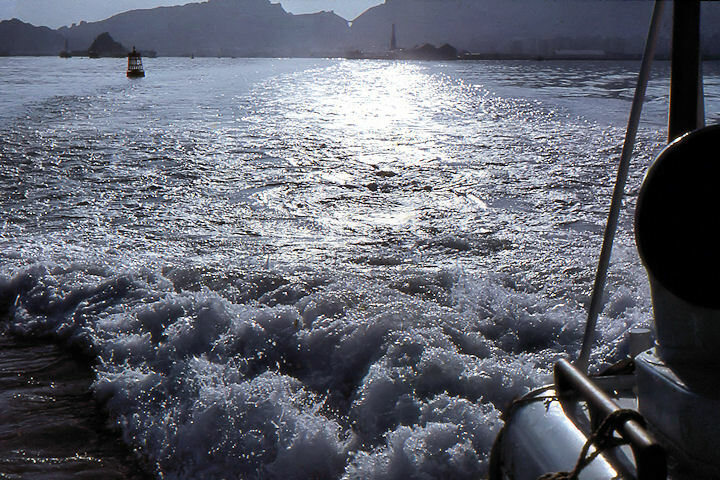 The short sequence below was taken by Keith when enduring a dash into the Red Sea on Air Sea Rescue launch, 2767, in 1962. 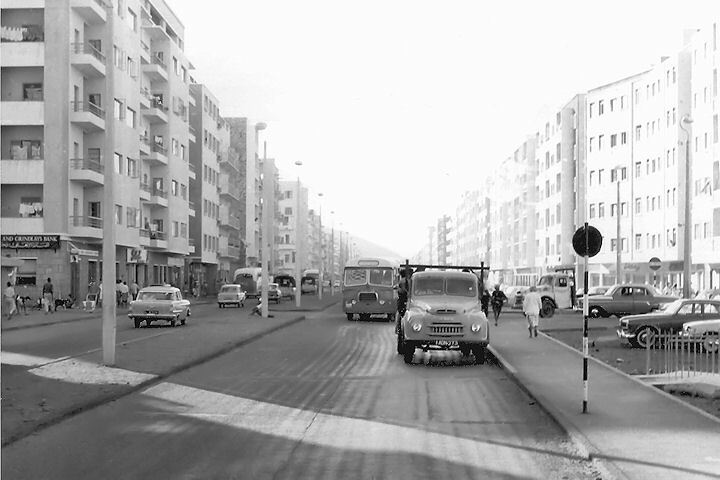 “I do remember the fantastic engine sound though. 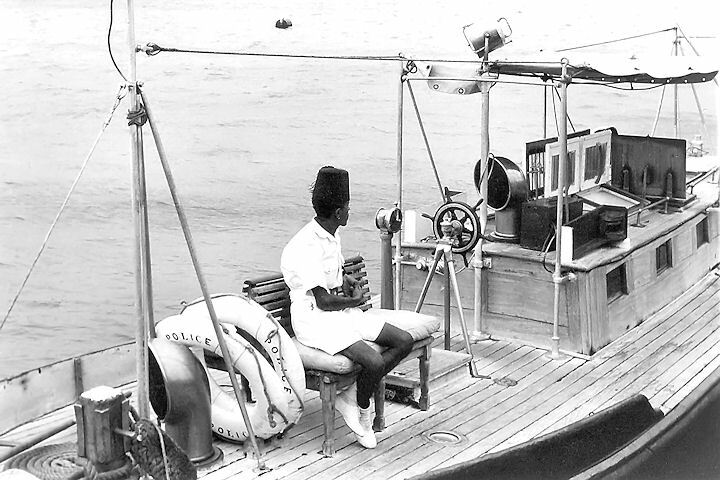 I photographed the yacht because I was told that the crew were on a round the world trip, which would have been unusual enough in 1961/2”. 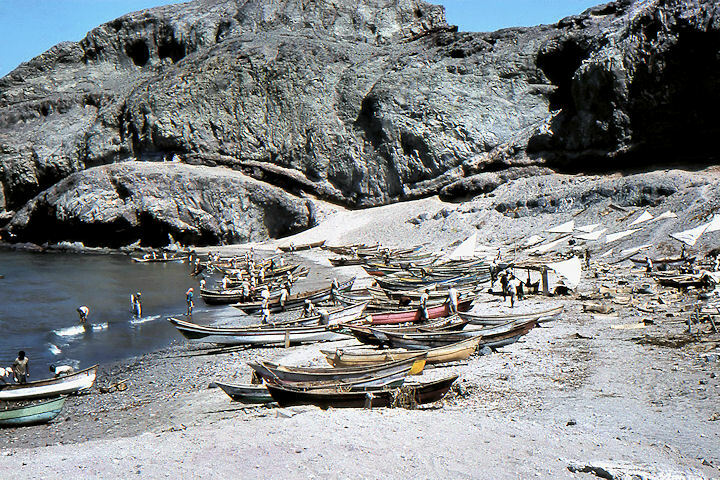 Having done their washing, its crew were taking a well deserved break at the time. 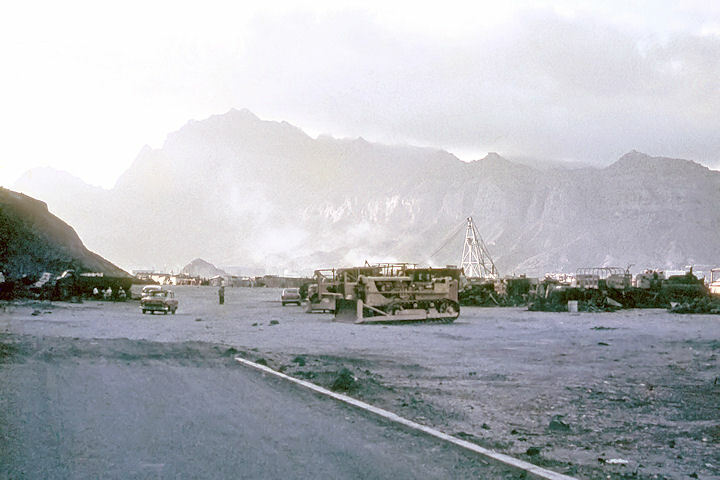 Jersey born and bred, airframe mechanic Bob Hambly served at RAF Khormaksar from 1958 to 1960 and has provided the following selection of images from his historical collection. 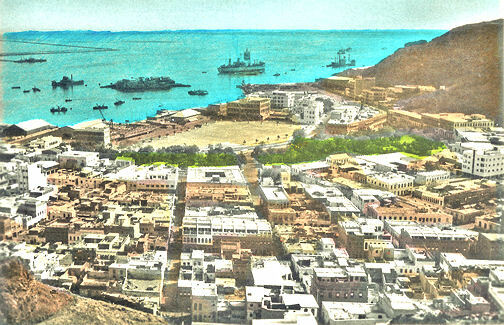 The period colour views are from a set of rare hand painted coloured prints Bob bought while in Aden and date from around the early 1950s. 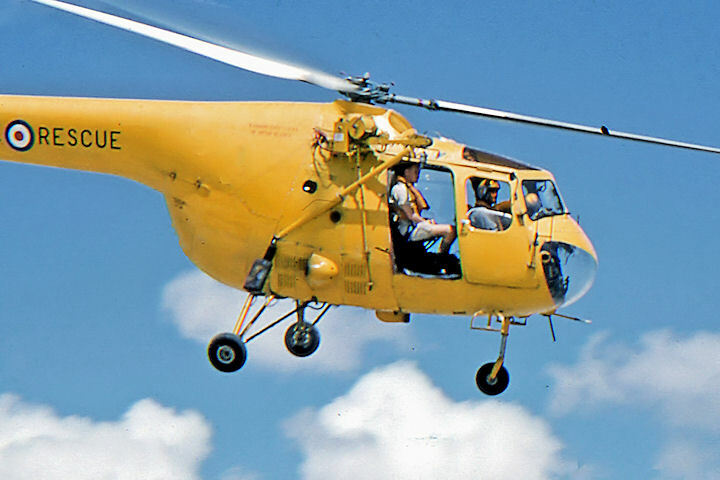 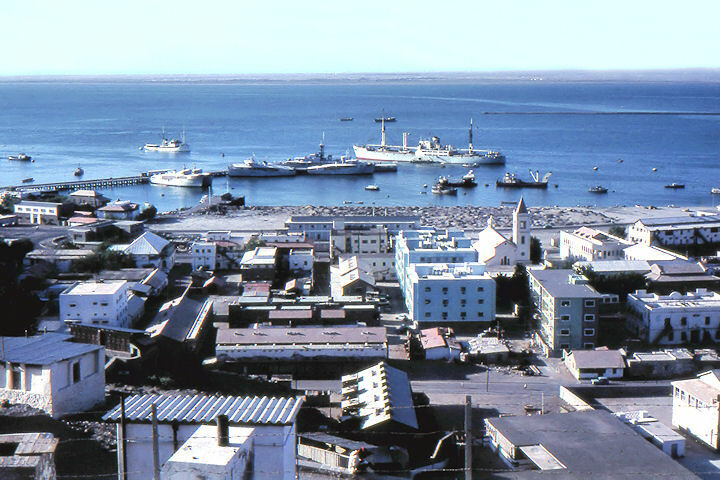 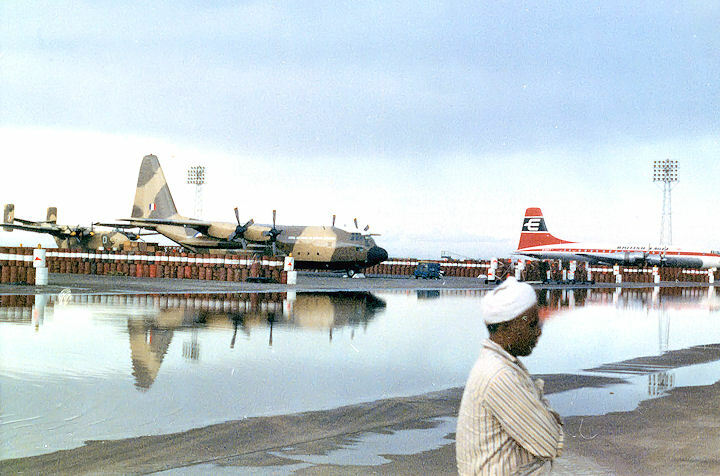 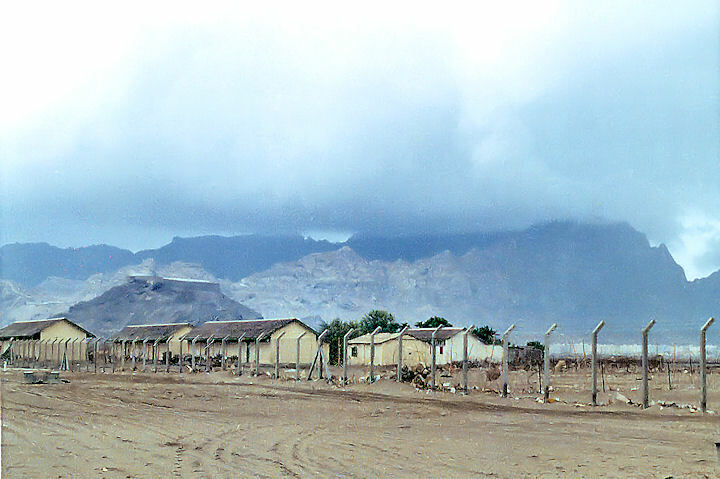 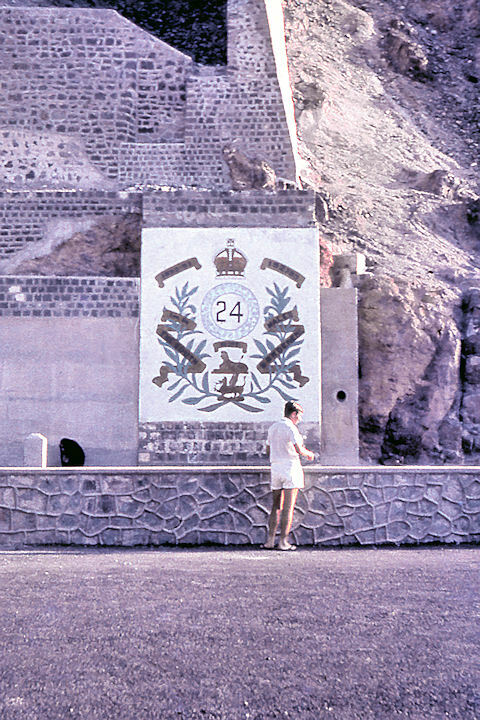 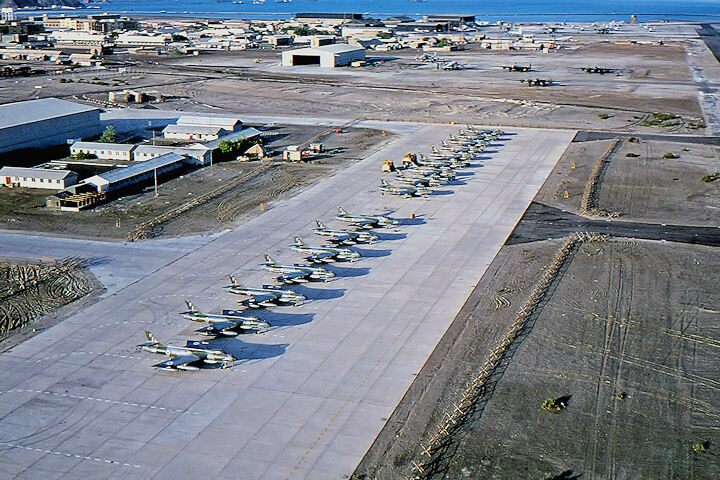 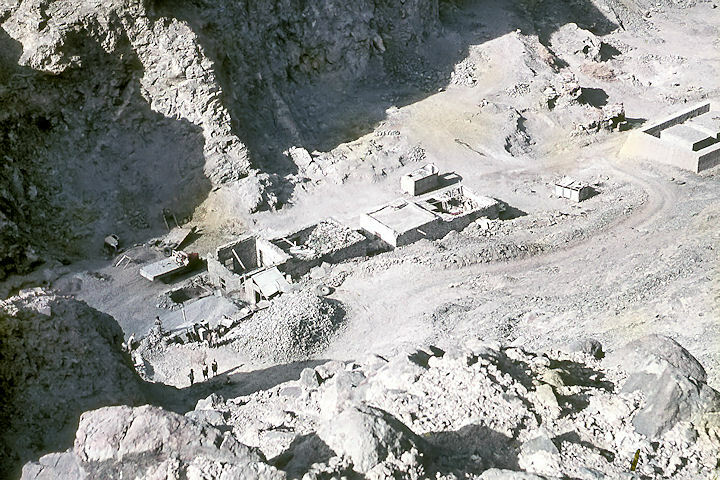 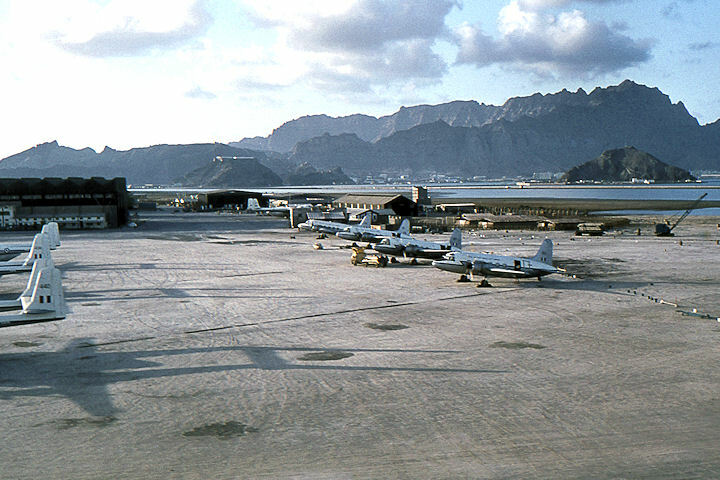 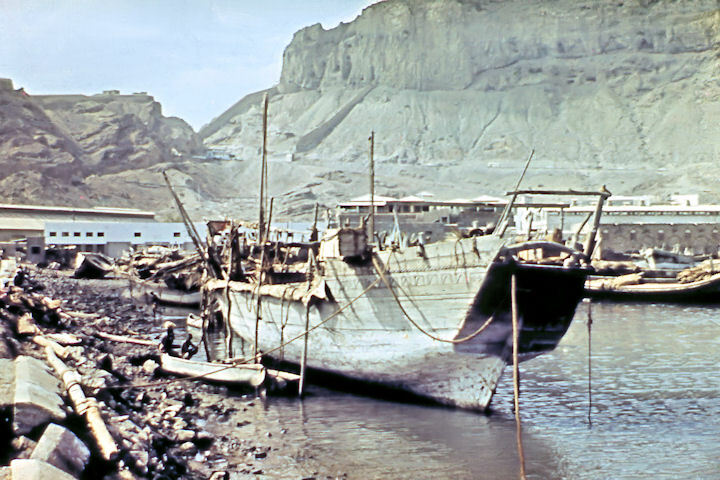 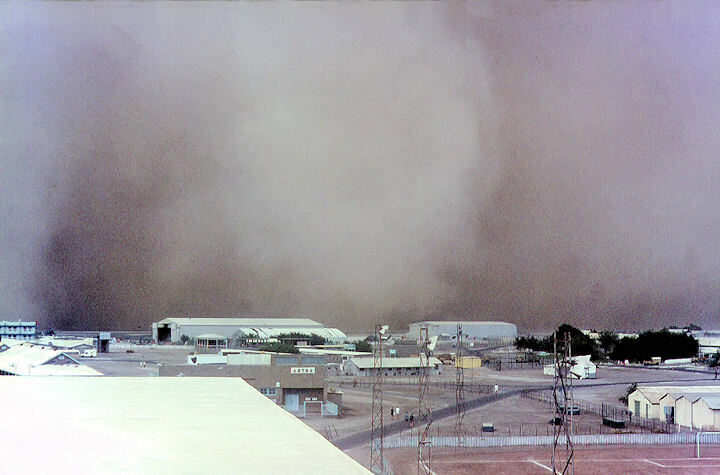 Ray served on 37 Squadron (Shackletons) at Khormaksar from 1959 to 1961 and has provided the following selection of coloured images from his collection. 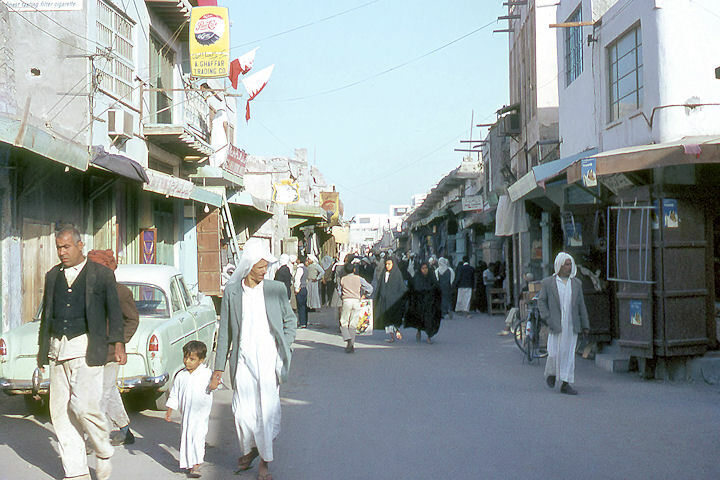 They were all taken in 1960.